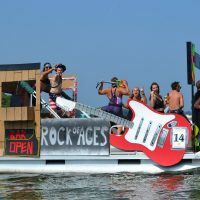 A fire warmed the crisp night air as the Raft-O-Rama committee huddled around it and discussed a highly important question. 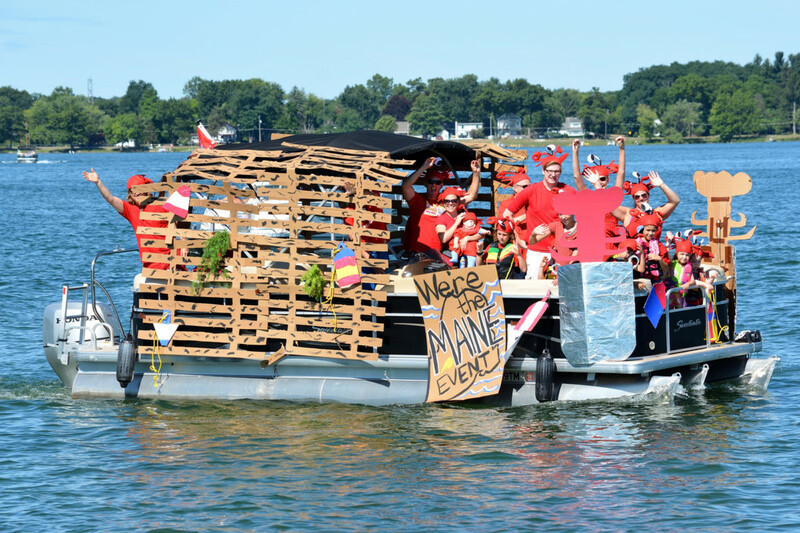 What will be the theme for Raft-O-Rama 2019? 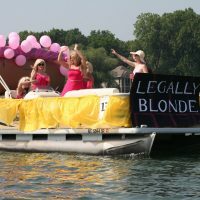 Saturday night’s decision was a ratification of the most requested theme from those in the community who suggested ideas. 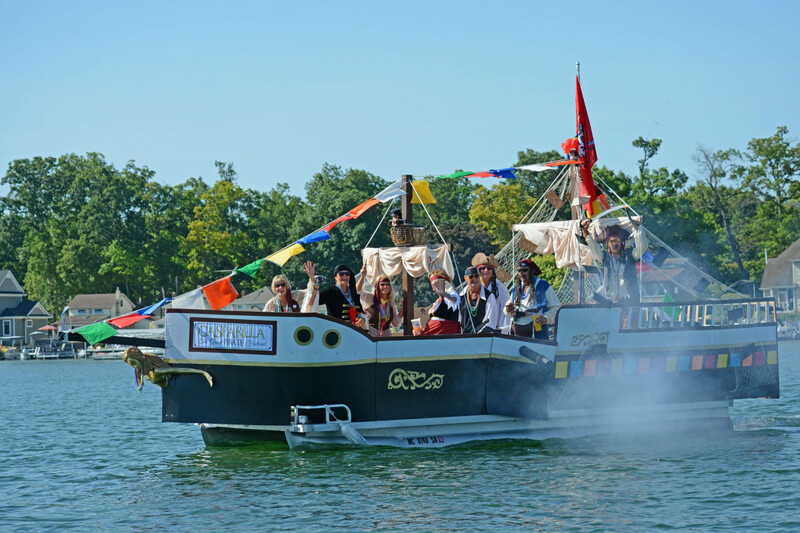 The theme for 2019’s Raft-O-Rama will be VIDEO GAMES. If you think that limits choices to Grand Theft Auto V and Minecraft, consider this. Nearly every board game you can think of has a video version, even the old standbys like checkers. 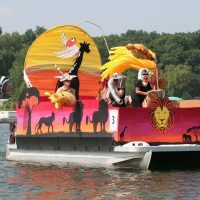 But of course, some current day innovations are sure to be represented as rafts take to the lake on Sunday, August 4th. 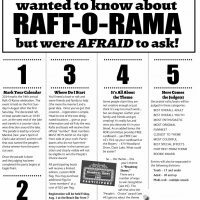 Click here for Secret Conversations – a look ahead for Raft-O-Rama 2018 and important details on how to participate. 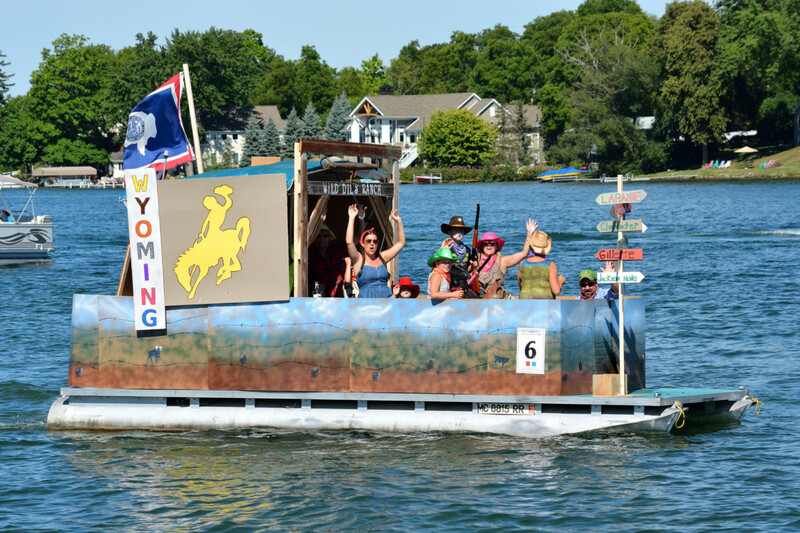 Click here to see Raft-O-Rama 2016, including the winners! 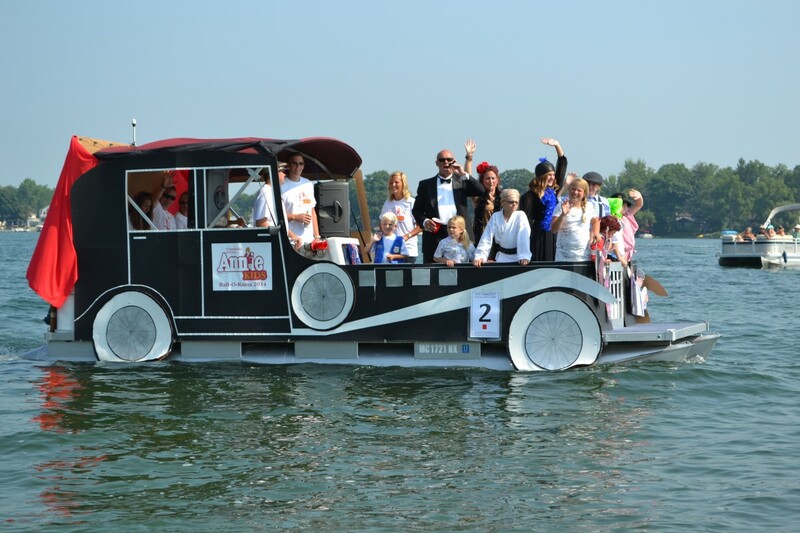 It is a great thing when good times help good causes. 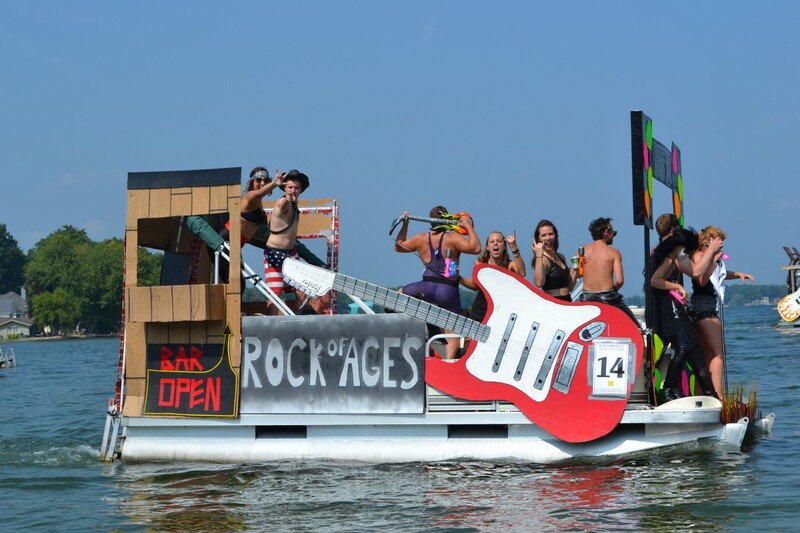 Over the last several years, Raft-O-Rama, Clark Lake’s premier annual event, has generated not only the funds necessary to sustain itself, but also a little extra. 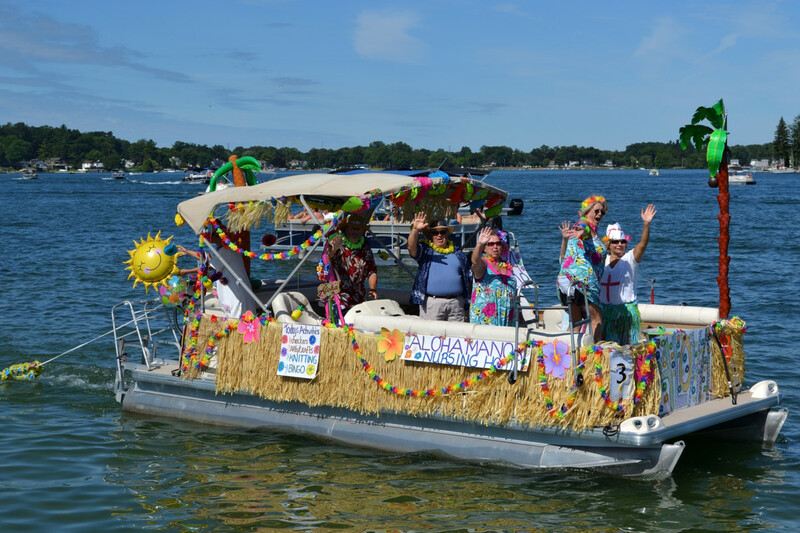 This is a result of sales of luminaries, merchandise, raffle tickets, and the many generous donations that are received year after year. 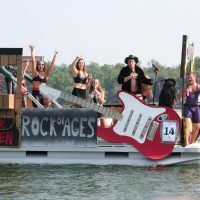 In recent years following the event, Raft-O-Rama has donated funds to the Spirit Trail, the Clark Lake Community Center, the Garden Angels and others. 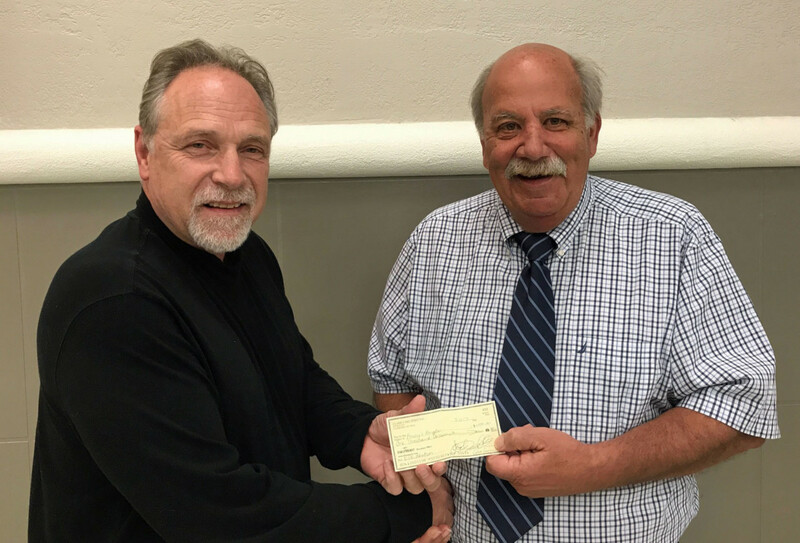 In addition to making donations to those very deserving organizations, this year the Committee went a little farther afield in response to a serious problem. 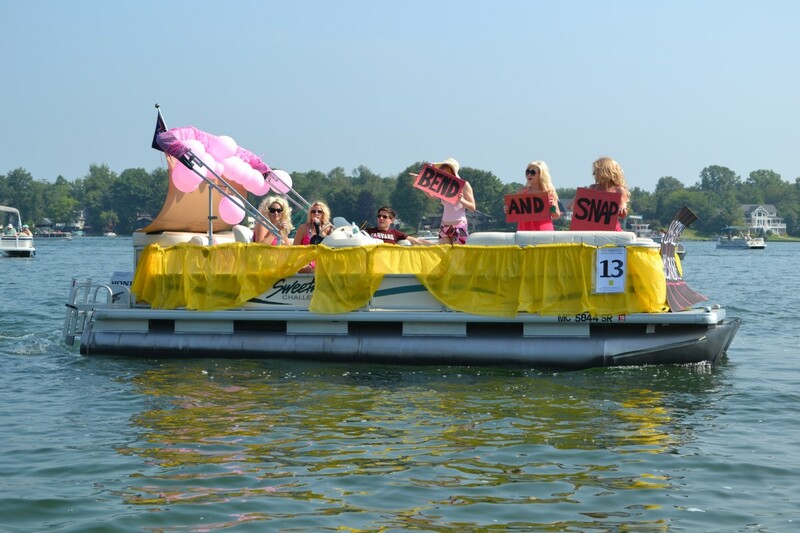 Andy’s Angels is a foundation established by Mike Hirst and his family following the tragic death of his son from a drug overdose. 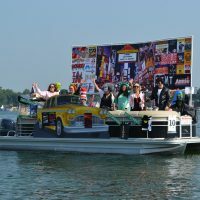 The Raft-O-Rama Committee, on behalf of all the citizens of the Clark Lake, presented a $1,000 donation to the Andy’s Angels Foundation. 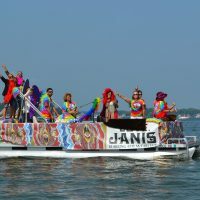 Andy’s Angels assists those with addictions to heroin and other opiates in getting into treatment, finding housing and jobs, and hopefully getting on the road to recovery. 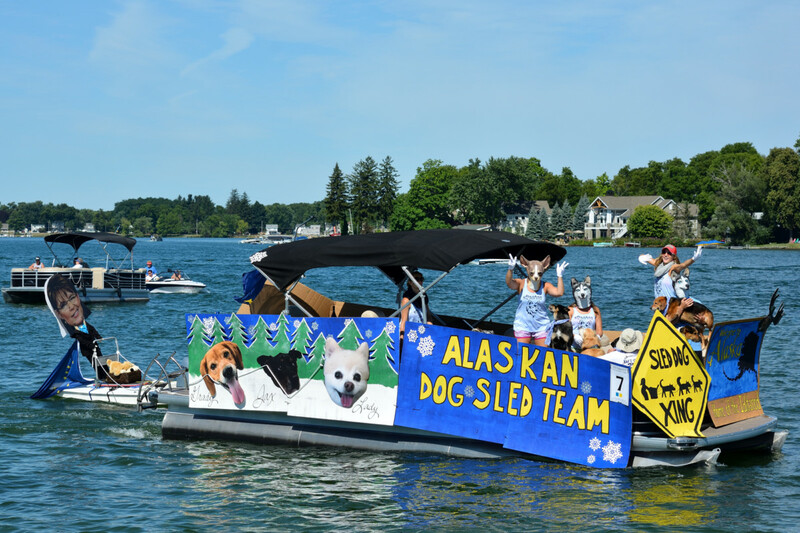 The Raft-O-Rama Committee is extremely proud to assist Andy’s Angels in this worthwhile endeavor and grateful for the support of the Clark Lake community to give us the means to do so. 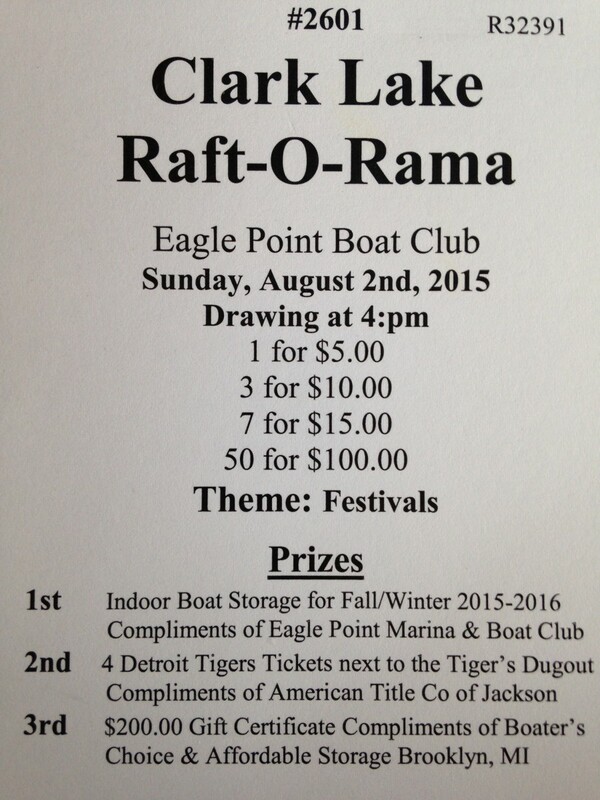 Note: Donations to Raft-O-Rama are tax advantaged when made thru Clark Lake Spirit Foundation, a 501c3. 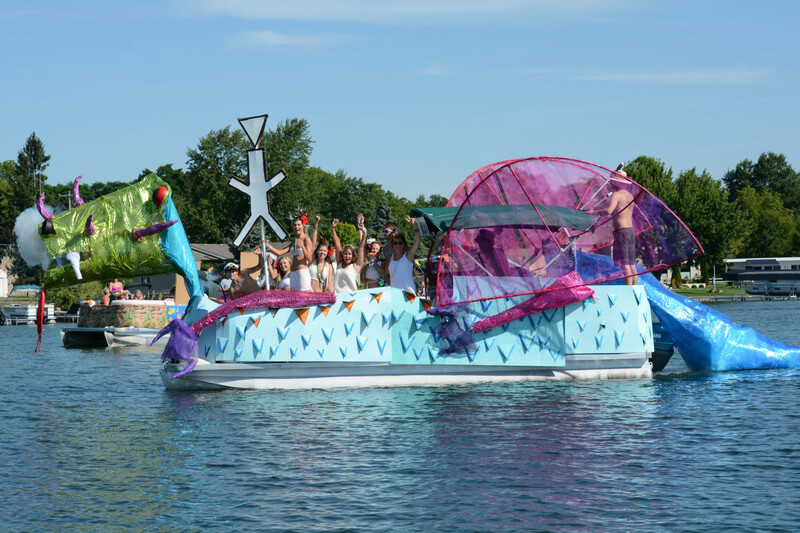 Raft-O-Rama is almost here. 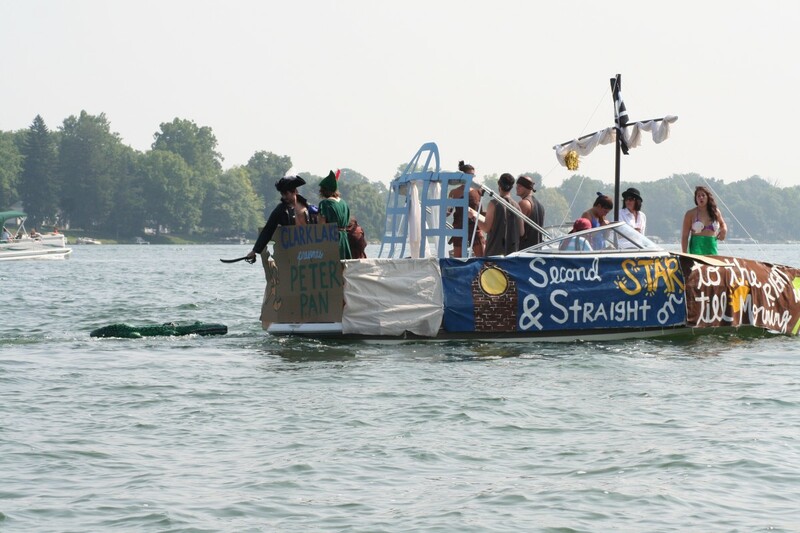 And the creative genius and engineering ingenuity of Clark Lakers are coming together for another amazing year. 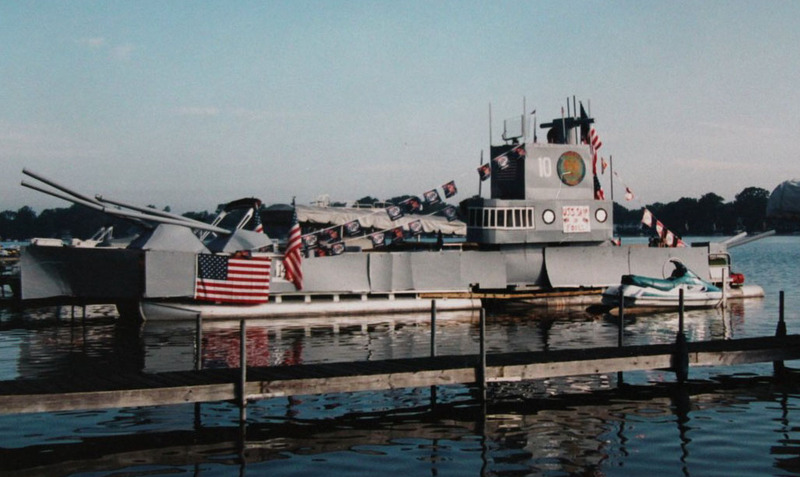 Plans are kept under wraps–stealth is the operative word of the week. 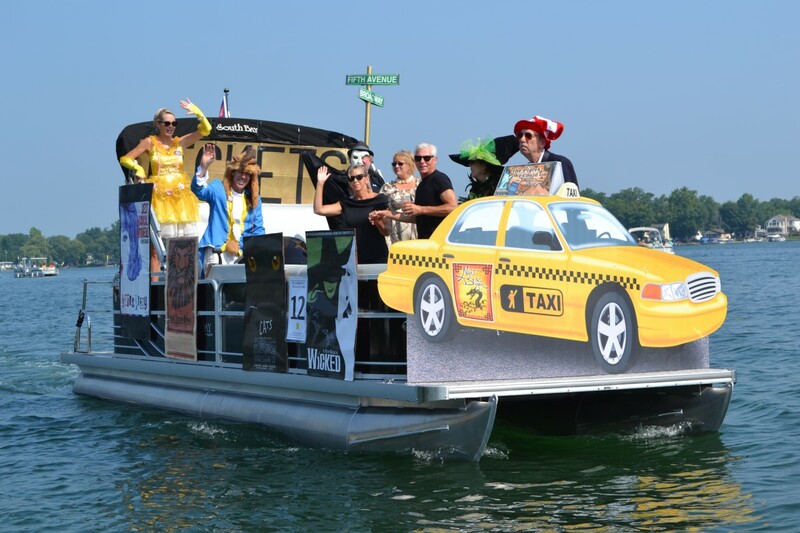 This 56th annual iconic event begins at 10:30 am, Sunday, August 7th. 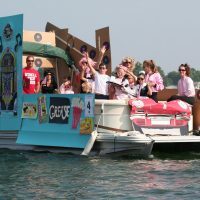 Winning moments are achieved by thorough preparation, not only in building and construction, but the other details associated with the event. 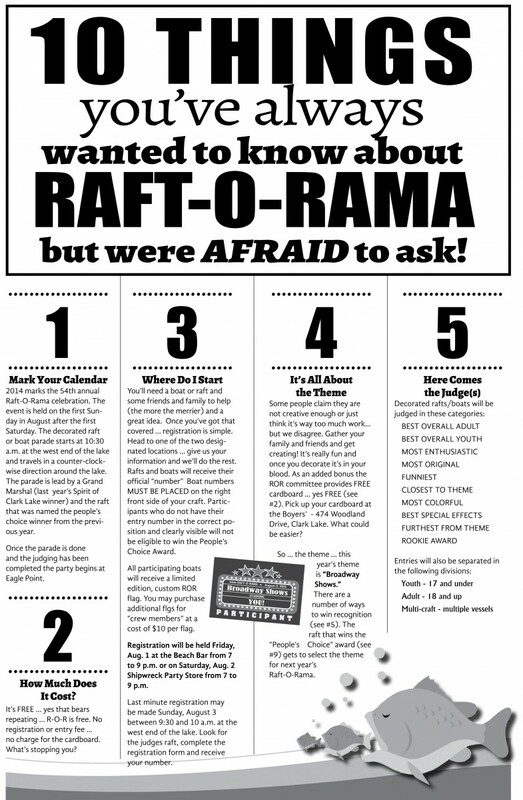 You can review “The 10 things you’ve always wanted to know about Raft-O-Ram but were afraid to ask” by clicking here. 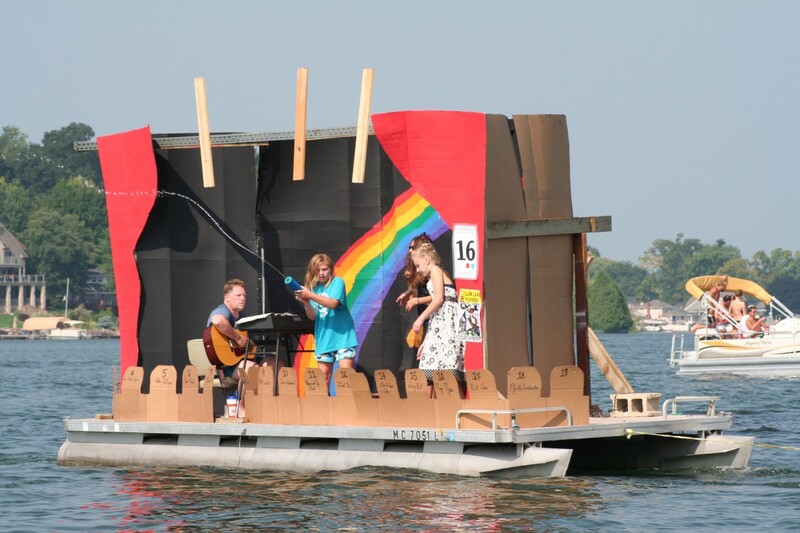 Cardboard is an essential building material, and here’s some really good news. It’s free! Tucker Boyers comments “the cardboard is generously donated by Georgia Pacific in Albion.” Tucker stores it at Gen 3 Leasing and Storage, free of charge. 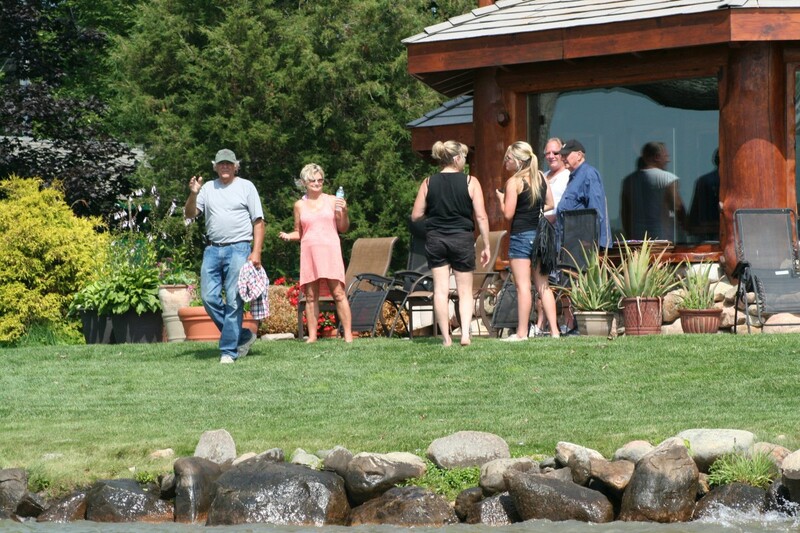 From there, he trucks it to the Boyers’ home at 474 South Woodlands Drive. 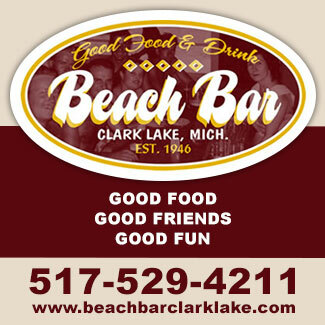 You can drop by weekdays 4:30 pm to 8 pm, and all day Saturday & Sunday. 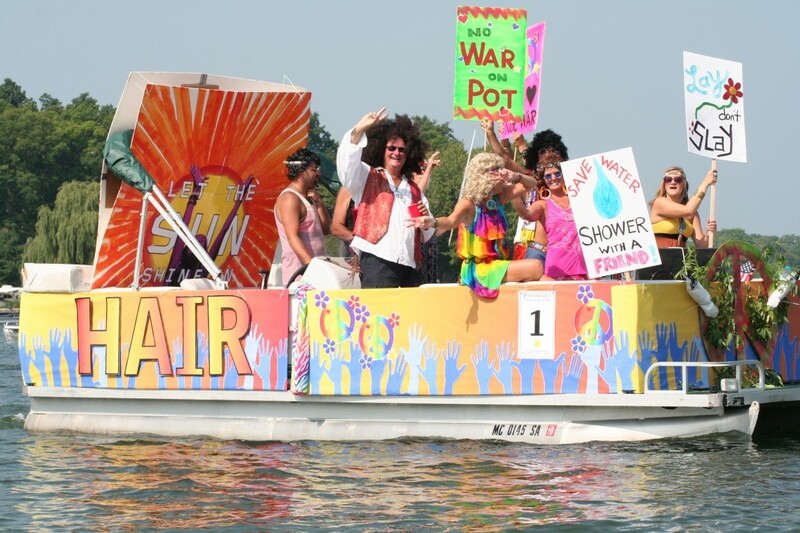 Every year the Raft-O-Rama committee showers Clark Lake with the latest cool things to wear and use. These items connect perfectly to the event. And here’s the added benefit to owning them. 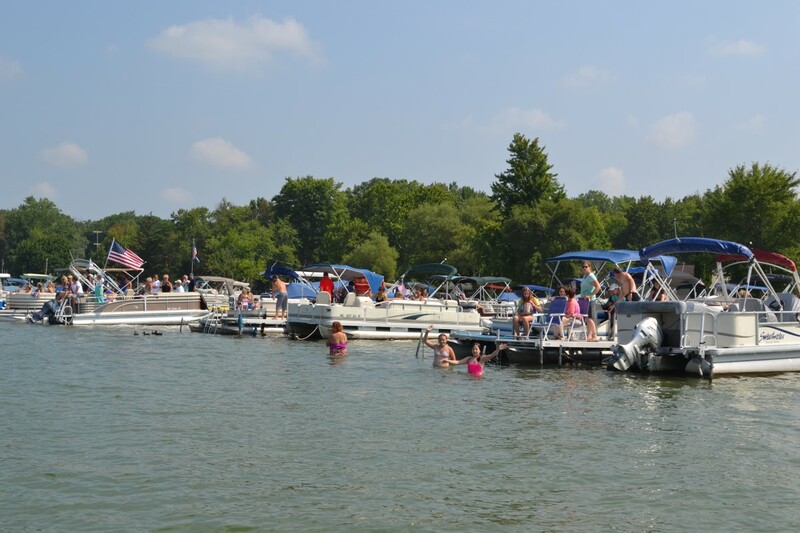 On wintry nights in January, they elicit wonderful reminders of warm summer days at Clark Lake. 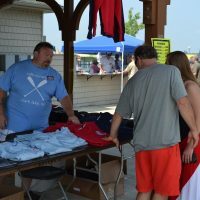 Towels are $35, hats $16, men’s t-shirts 15, and women’s $20. 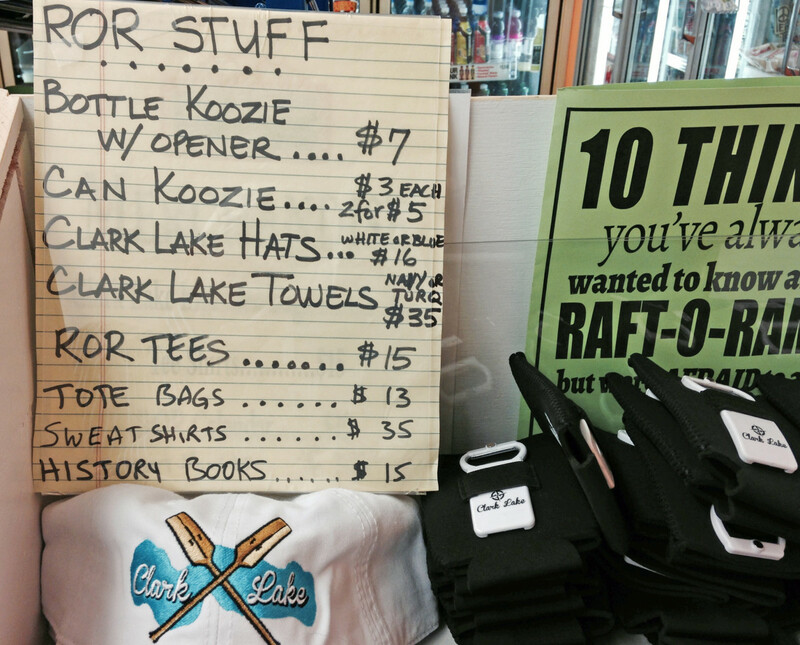 You can purchase these goodies at Doyles and at the Point on Raft-O-Rama Sunday. 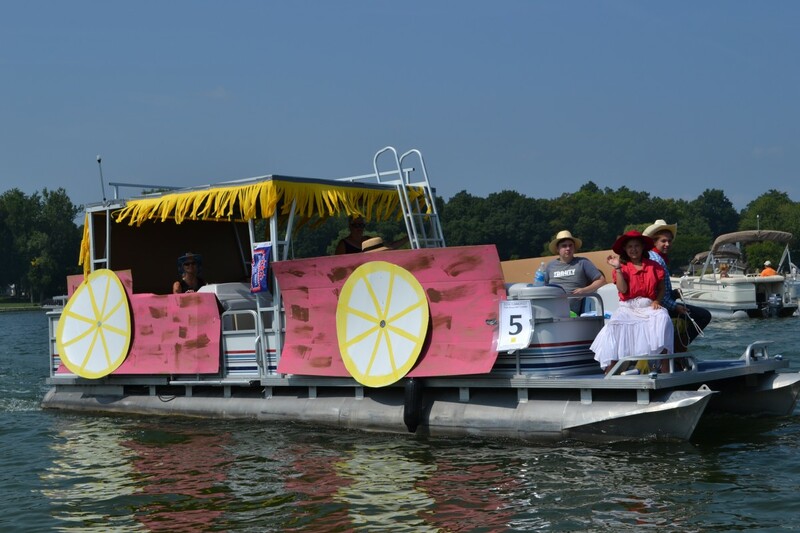 Below are some of the people who bring you Raft-O-Rama–with oars up, the committee! 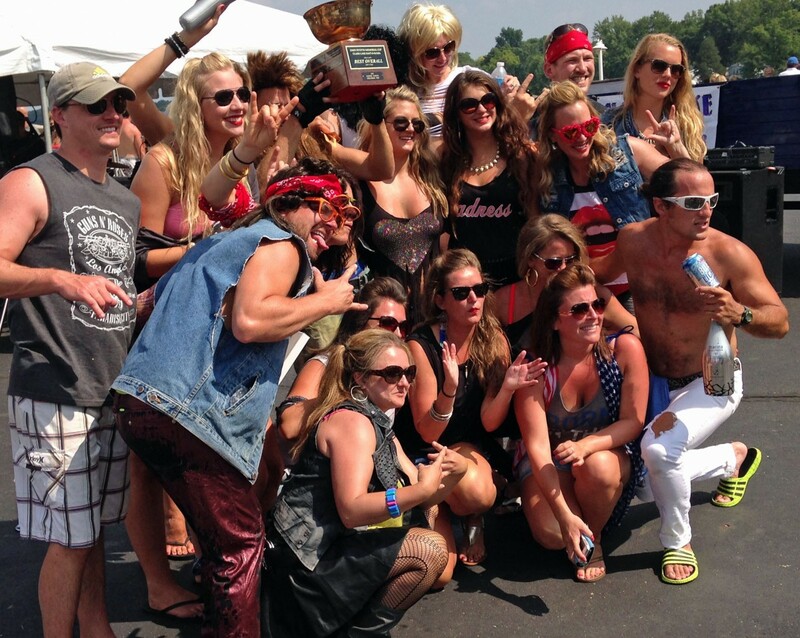 To revel in last year’s glory, click here. 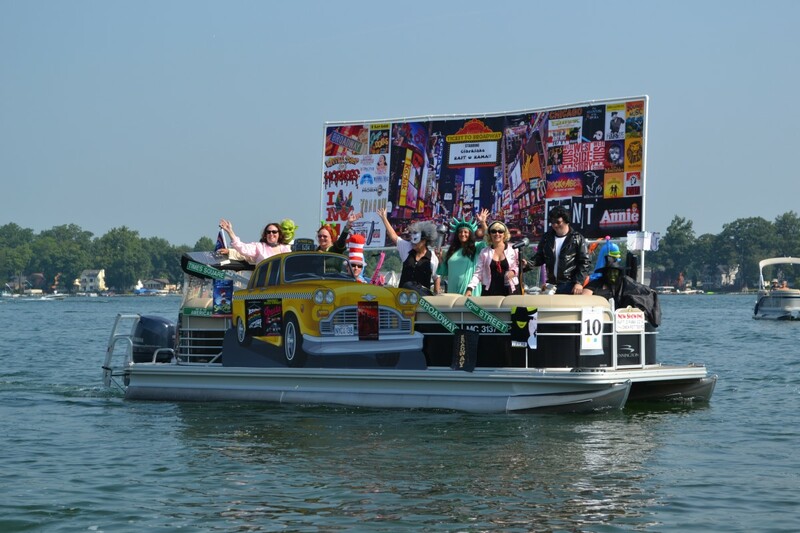 The Raft-O-Rama Committee continues its quest to light up the lake on the evening of Sunday, July 3rd when Independence Day will be celebrated at Clark Lake. 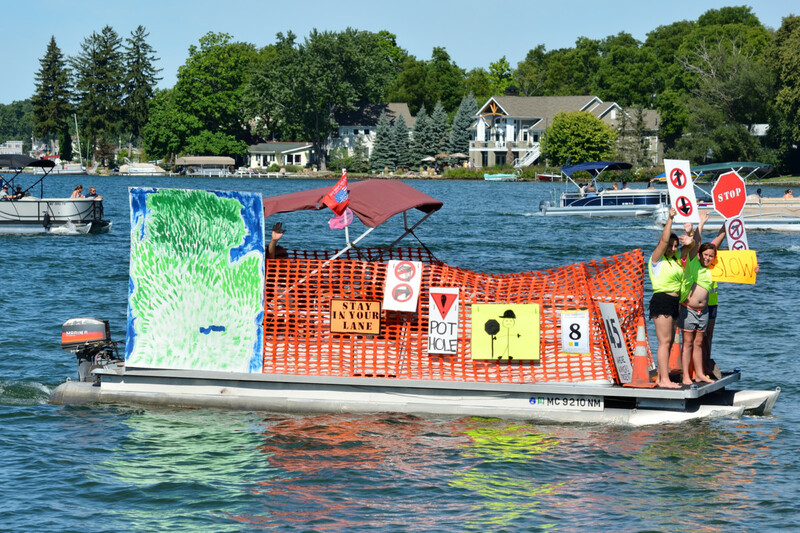 The committee is canvasing the lake so that residents can participate by placing the luminaries equidistant along their shorelines. The luminaries consist of a small paper bag, weighted by sand, with a candle inside. 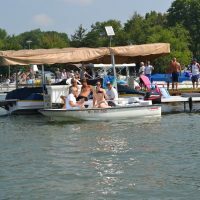 Lighting them at dusk will give the lake the glow that has grown each year and is the perfect lead-in the fireworks later in the evening. 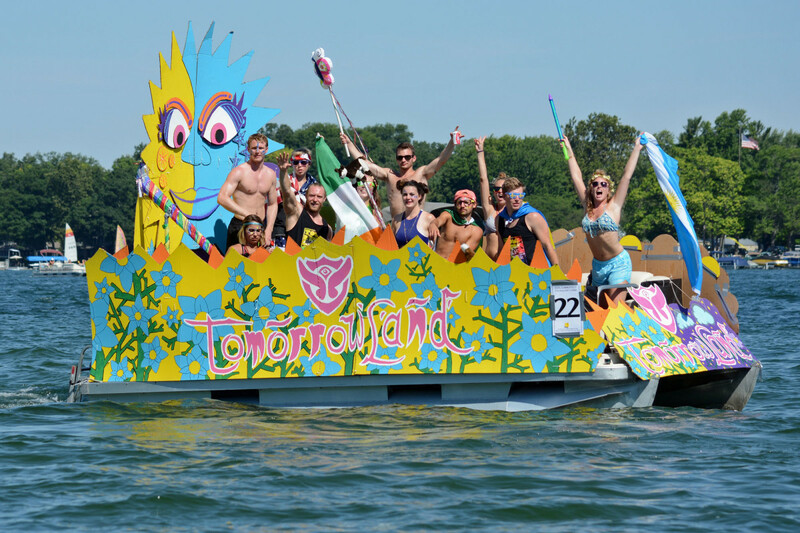 Click here to learn about the plans for fireworks. 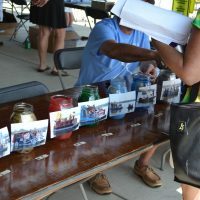 If the committee member missed your home, you can pick up luminaries at Doyle’s Market on Hyde Road. 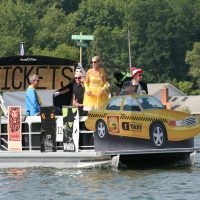 For further information, call one of these committee members: Tricia Boyers 206-2985, Pam Ricker 937-0325 or Beckey Ligibel (419) 277-2778. 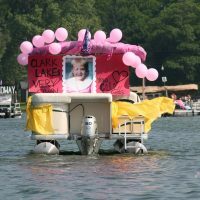 The luminaries come in Clark Lake tote bags (suitable for use on cold winter days to remind the owner of warmer summer fun at the lake). There are ten luminaries per bag–the already assembled version is $15; the DIY version with all necessary ingredients is $10. 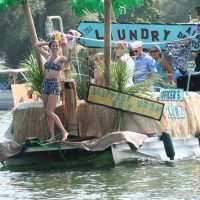 The contribution helps defray expenses in putting together Raft-O-Rama each year. 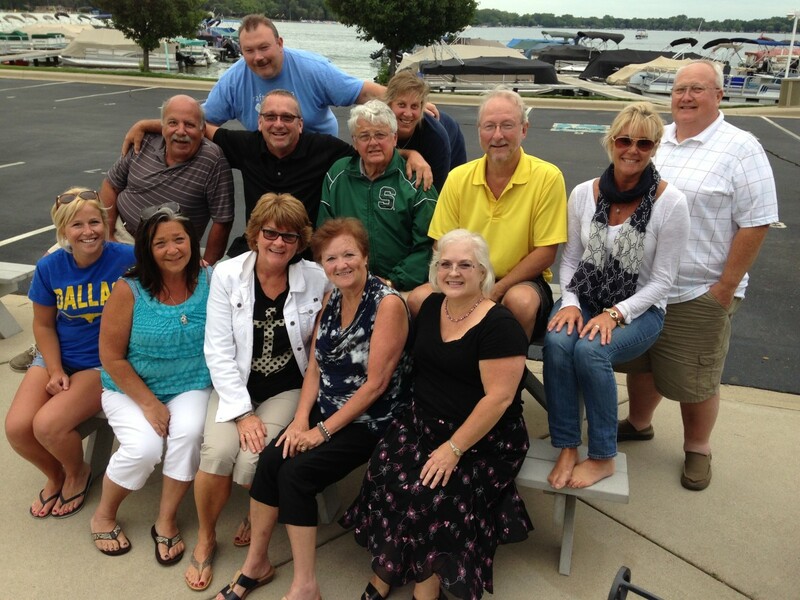 Below are some of the committee members. They gathered recently to work on the luminaries. 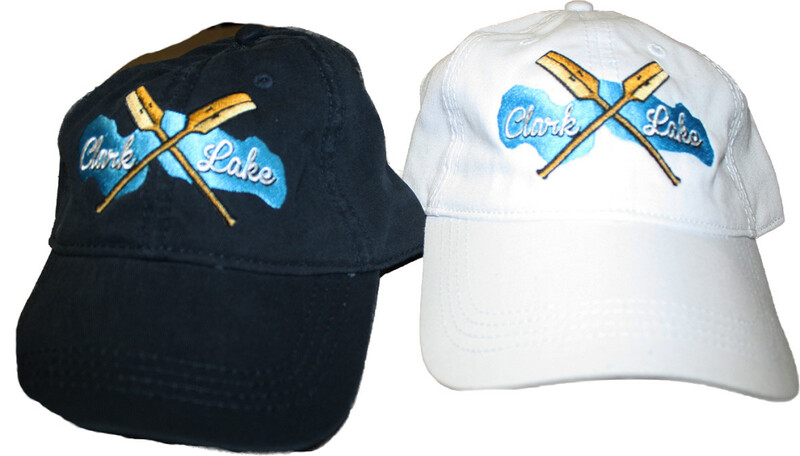 The Committee also features new Clark Lake goodies every year. 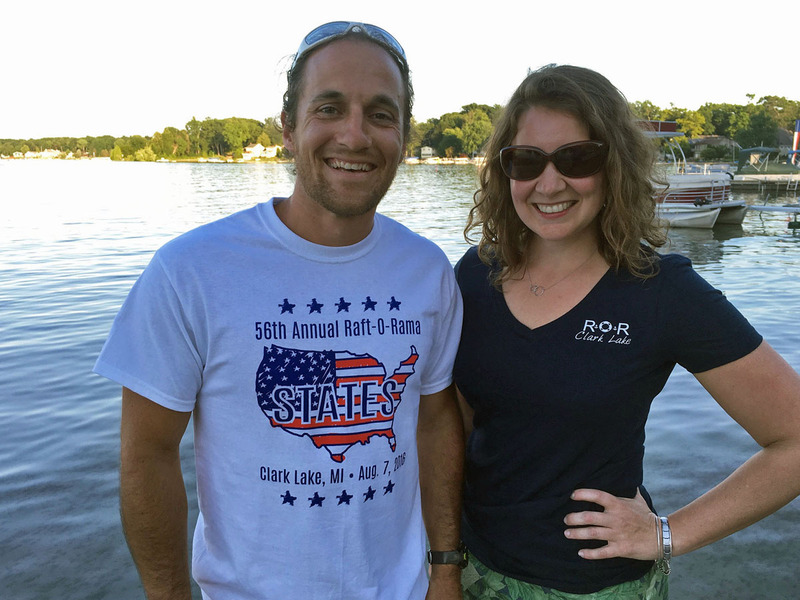 Here are the new t-shirts available at Doyles (men $15, women $20)–modeled by Dan Omo and Becky Hones. 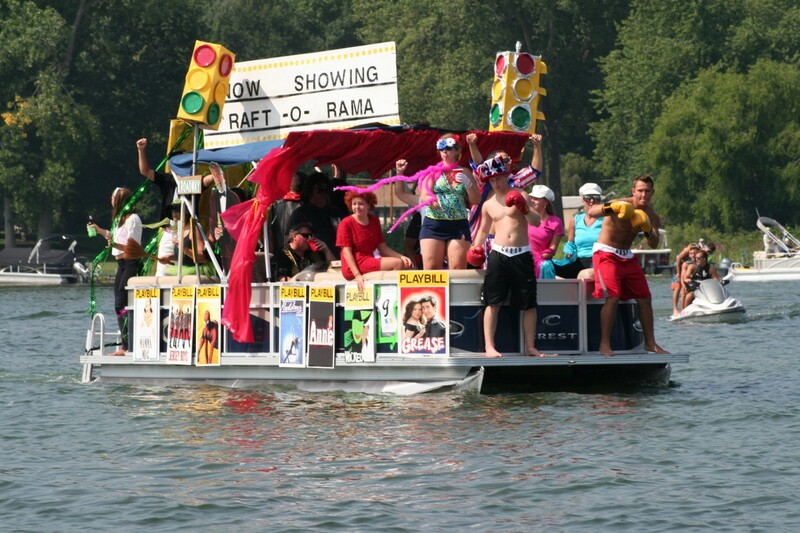 Once again, the people who bring you Raft-O-Rama want to help you light up the lake on Sunday, July 3rd. 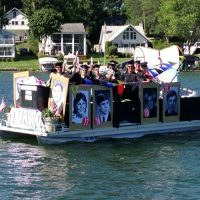 The Raft-O-Rama committee is offering luminaries to line Clark Lake’s shoreline in honor of Independence Day. 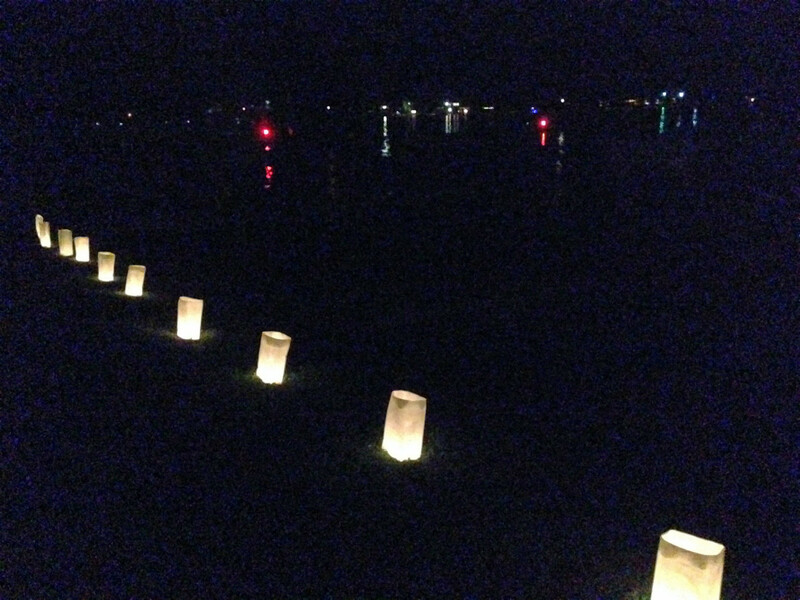 The luminaries are candles placed in small paper bags weighted with sand. Once lit, they can illumine the shoreline well into the night or early morning hours. 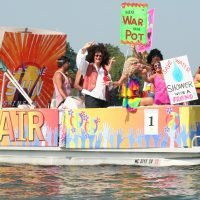 In past Fourth of July celebrations, their soft glow was the prelude to the “bombs bursting in air” later in the evening. 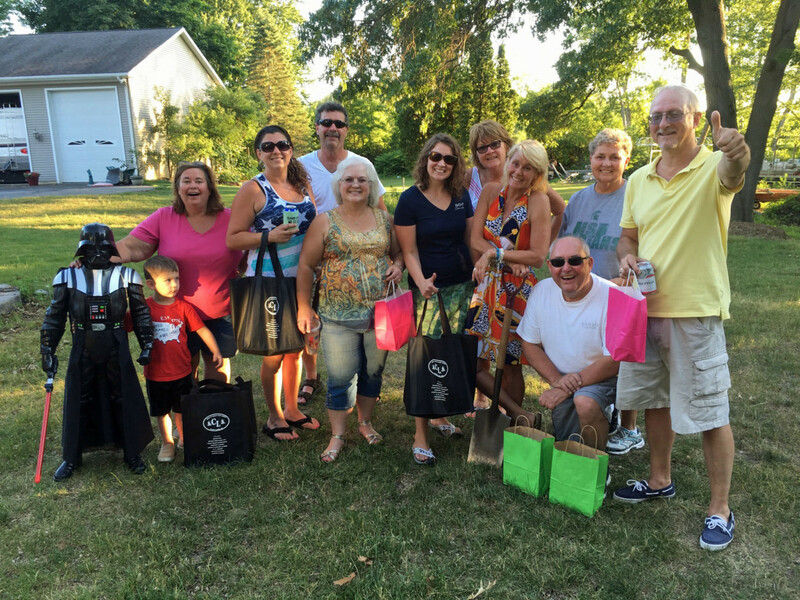 The luminaries are ten to a tote bag. Fully assembled, ready to light luminaries are $15. A do-it-yourself version is $10. 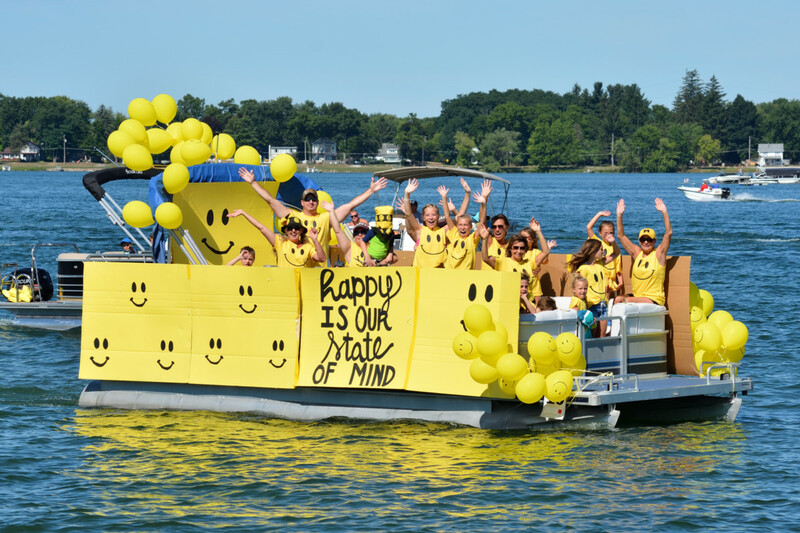 The Raft-O-Rama team is preparing to go door to door around the lake offering the luminaries, and they are also available at Doyle’s on Hyde Road. 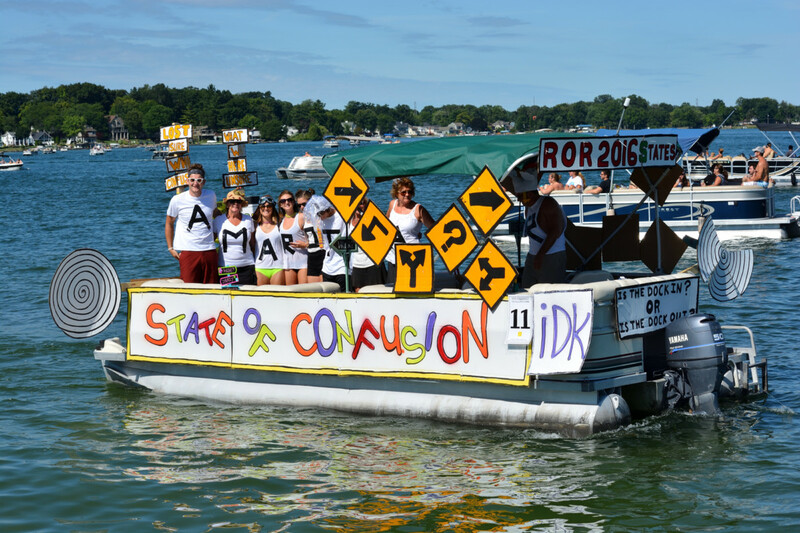 The RoR goal is to create the maximum glow along all shorelines on Sunday, July 3rd. 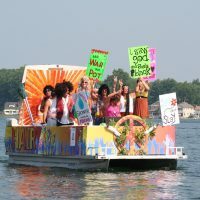 Every year, more residents participate. 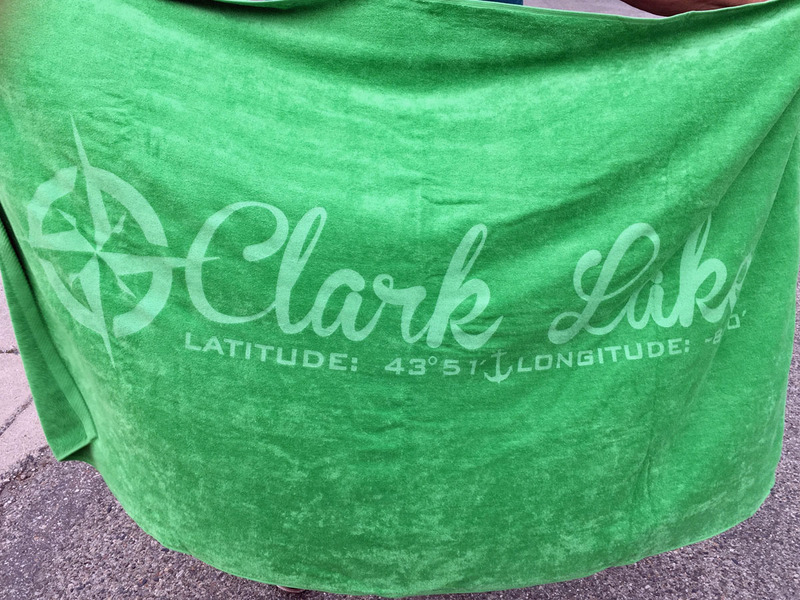 You get to keep the Clark Lake tote bag to use for other purposes, including lugging items around in the middle of winter when there is a need to remind yourself of summer fun at the lake. 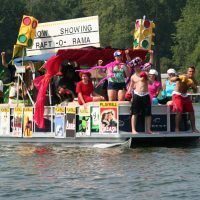 There are costs involved with Raft-O-Rama and this project is a method of defraying some of those expenses. 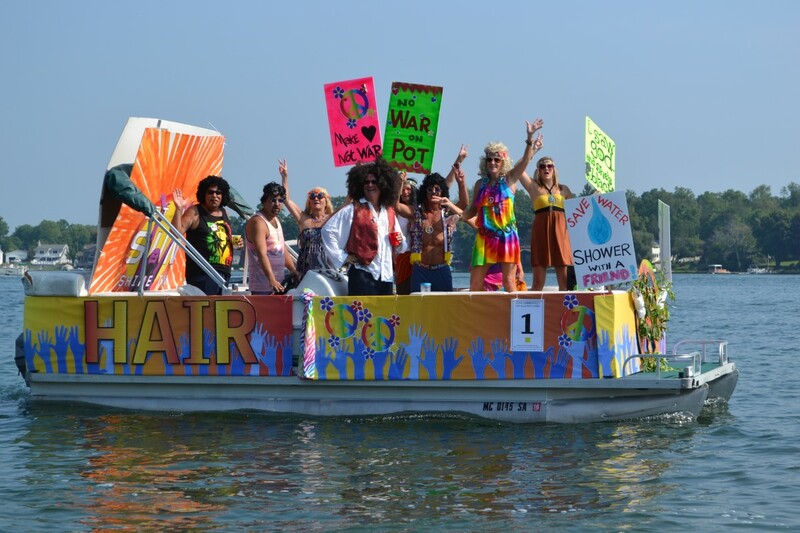 Equally important to true Clark Lakers is to have the last R-O-R-ware. 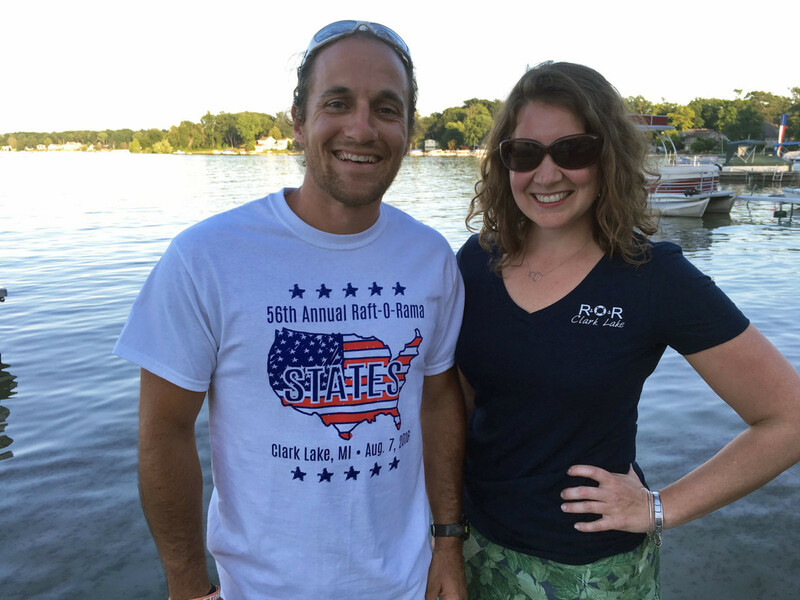 This year there are two new t-shirts modeled here by Dan Omo and Becky Hones. 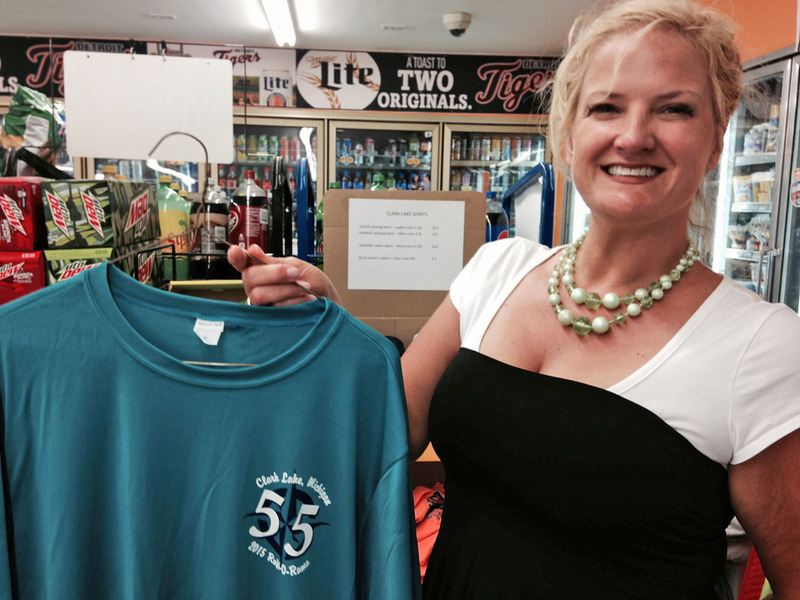 Shirts for men are $15; for women, $20. Get yours at Doyle’s. 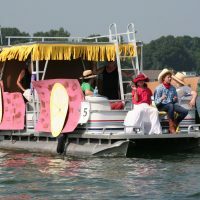 Raft-O-Rama this year begins the morning of Sunday, August 7th. 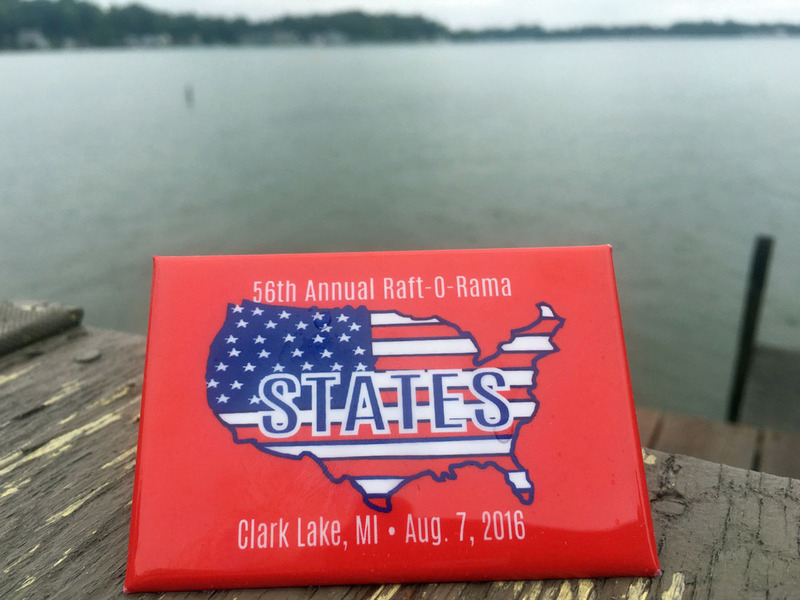 The theme is “States.” Click here for more info on one of the finest and most fun events at Clark Lake. It was as if the creativity erupted like a volcano, except in a much more gentle way. 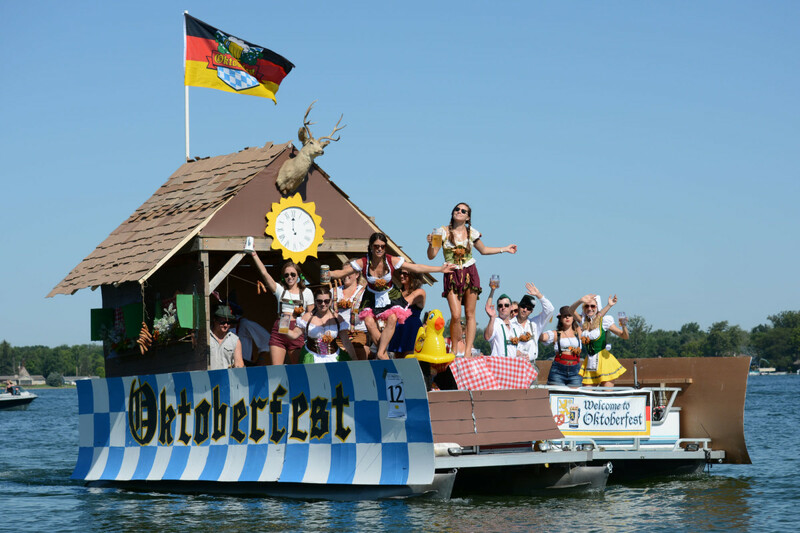 It would be hard to pinpoint the best ever Raft-O-Rama, but it were possible, this one would be a strong contender. 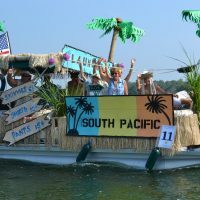 In all there were 27 rafts entered. 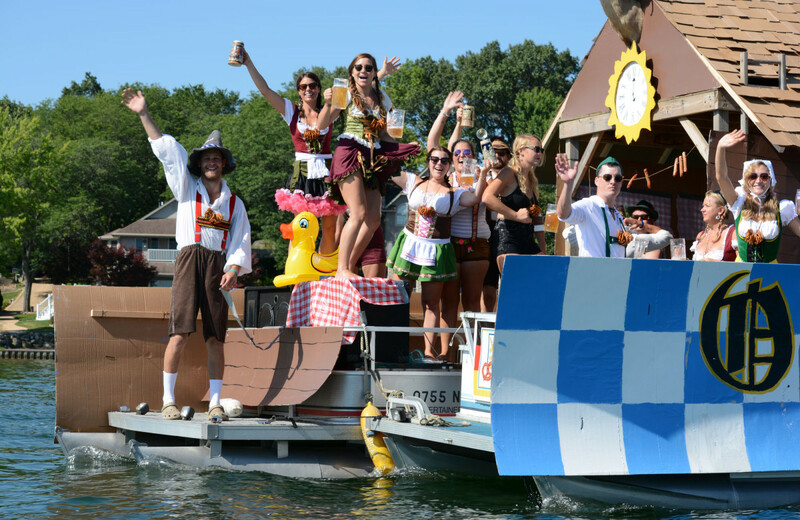 Right on schedule, they assembled at the head-of-the-lake and started their journey around the shoreline. 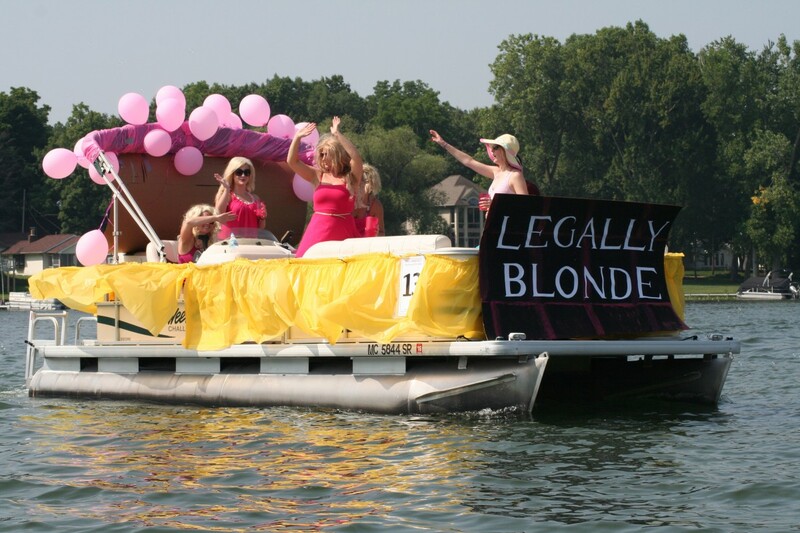 Judging this event must be very difficult. 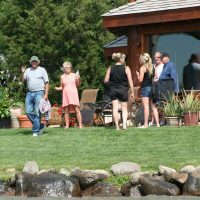 But someone has to do it, and the results are in from the awards ceremony held at 4 pm at Eagle Point. Overall winners get the good news at Eagle Point this afternoon. 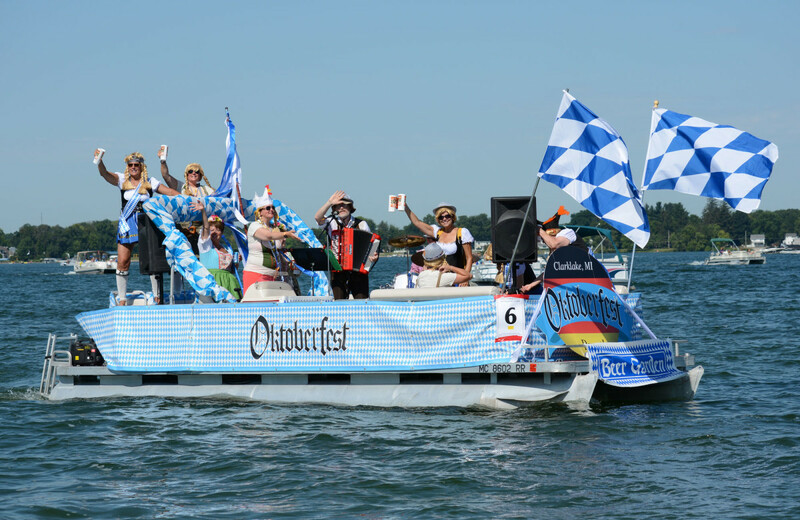 And more great rafts–27 in all! 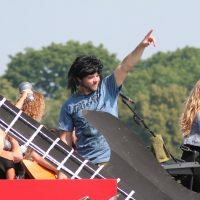 Many more photos will be added soon. Stay tuned! To view the photos below, click on the first. Then move your mouse over to the right side of the photo until an arrow appears. Click on that arrow to move seamlessly to the next photo. 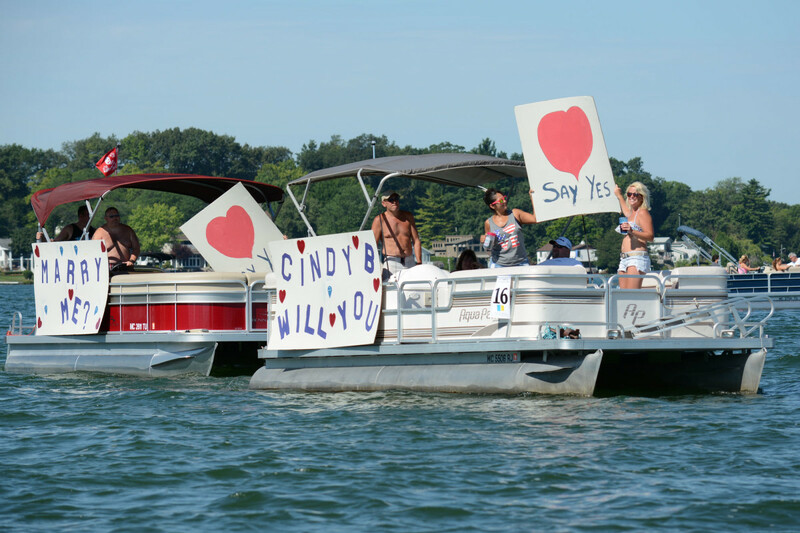 Secretive ways are continuing around Clark Lake. 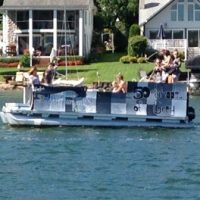 If a stranger were to visit, he or she might wonder what’s up with these people? What are they hiding? 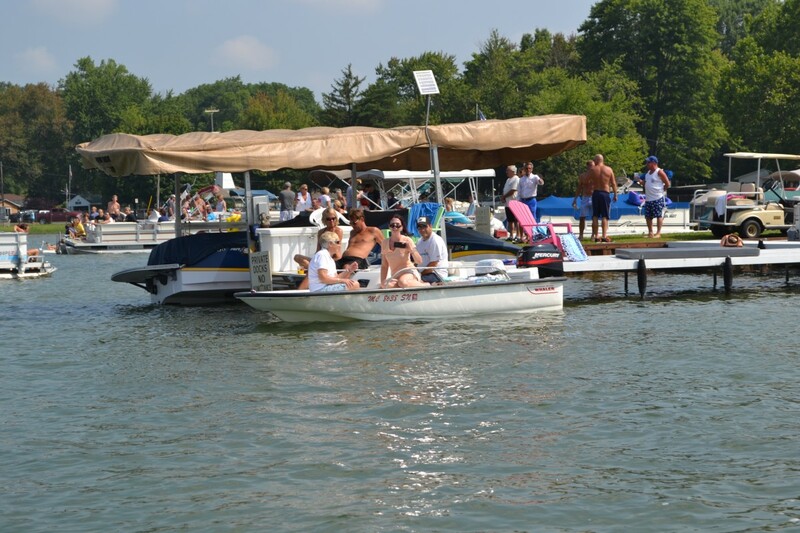 As those who live at the lake know, the work going on now must be kept under cover; and communications, sotto voce. 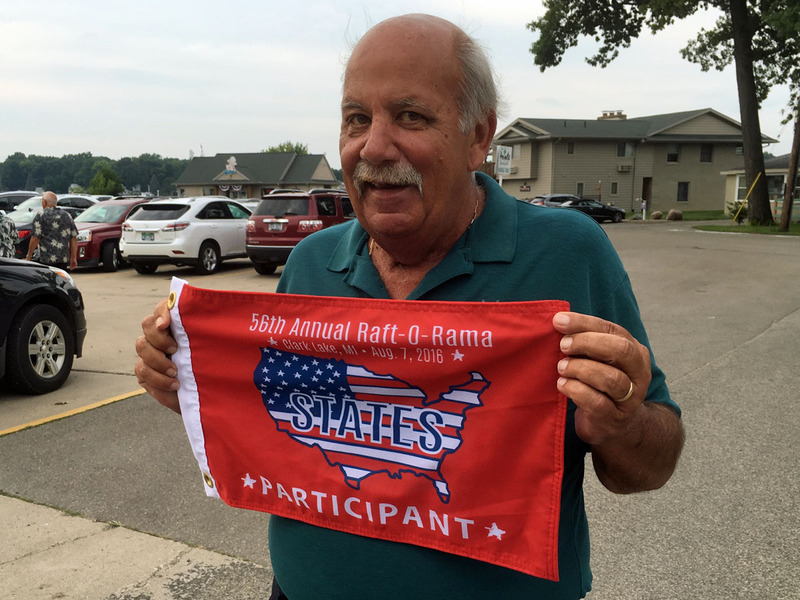 The preparations are for the 55th Raft-O-Rama this Sunday (August 2). 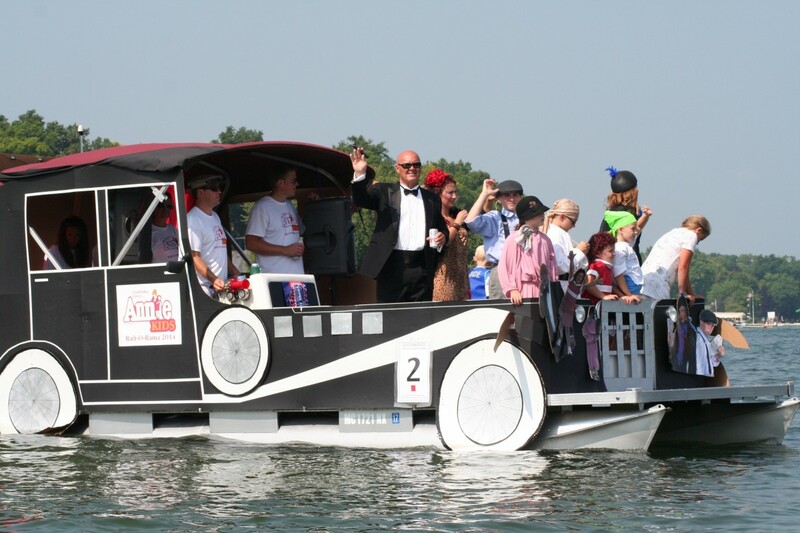 Extraordinary feats of creativity and engineering are taking place even as you read this. 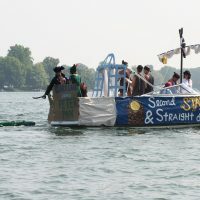 The goal is to convince the independent judges that their raft, created around the theme “Festivals”, should be declared a winner. And for the rest of us, it’s a show not to be missed. 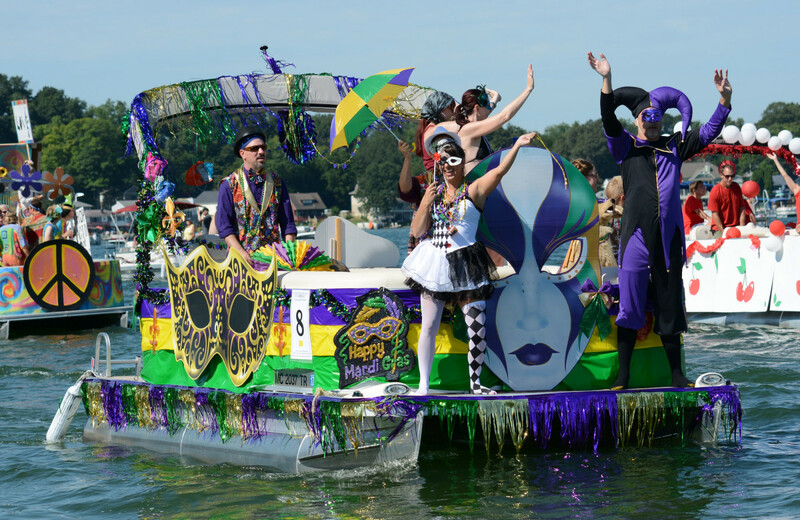 Rafts assemble at the head-of-the-lake at 10 am and the parade begins at 10:30 am. 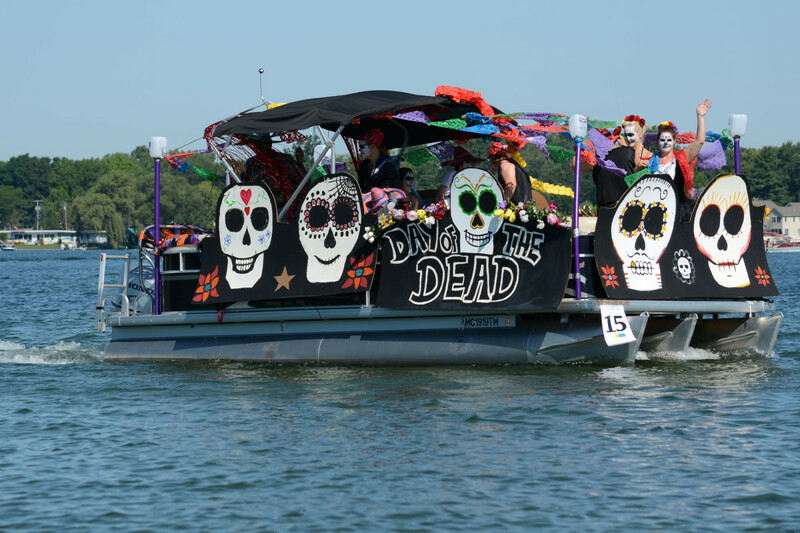 The decorated rafts follow the shoreline moving in a counter-clockwise direction. 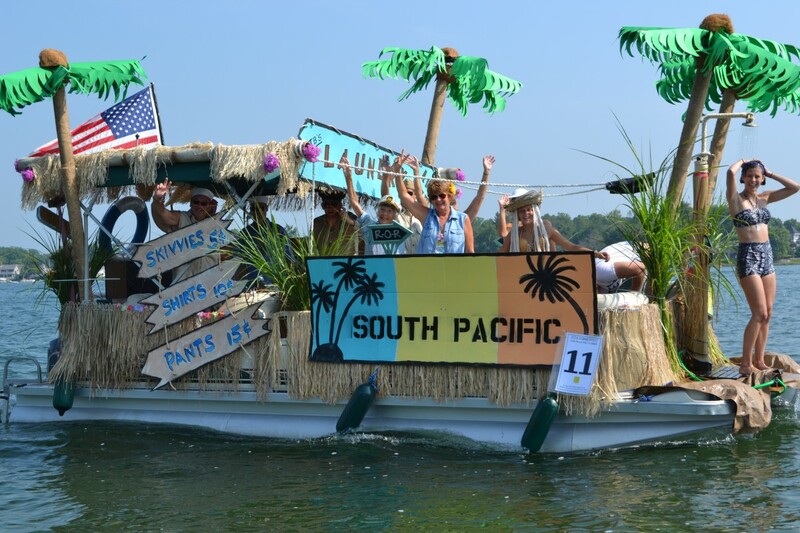 Raft registration is tomorrow (Friday) 7 to 9 pm at the Beach Bar or Saturday 7 pm to 9 pm at the Shipwreck Party Store on Eagle Point. If you’re at the Beach Bar on Friday evening, you may also want to meet the greatest American marathon runner of all time between 6 and 8 pm. 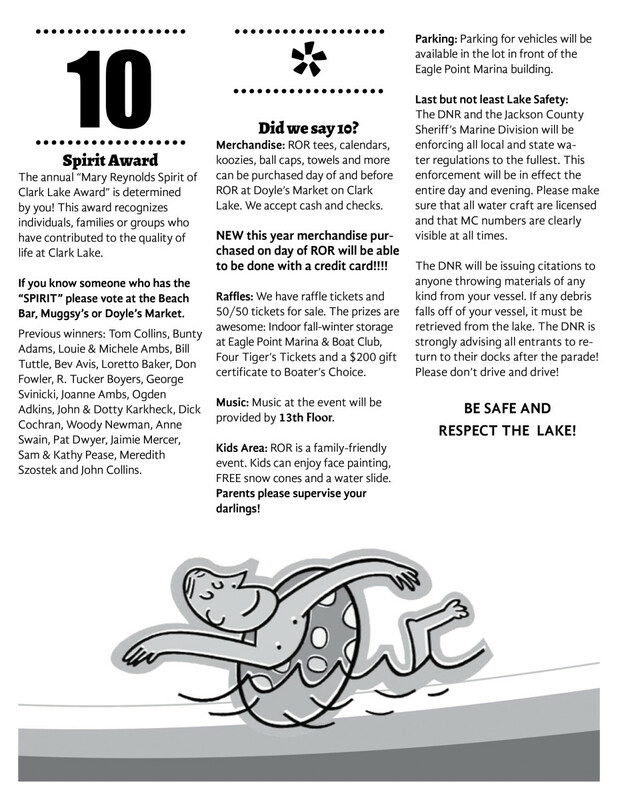 Bill Rodgers will be featured during preregistration for Run Clark Lake to take place Saturday morning. 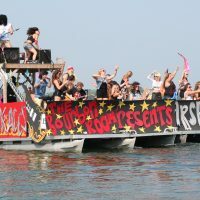 For lots of R-O-R details, scroll down for the “Ten Things You Need to Know about Raft-O-Rama”. 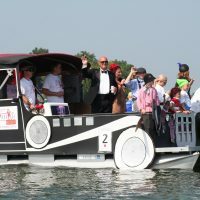 As regular viewers of this website already know, the fireworks scheduled for tomorrow evening (July 31) have been cancelled due to insurance and liability issues. 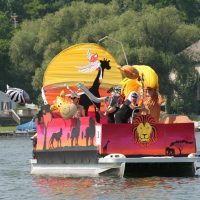 The Raft-O-Rama committee is discussing rescheduling them at a later date. 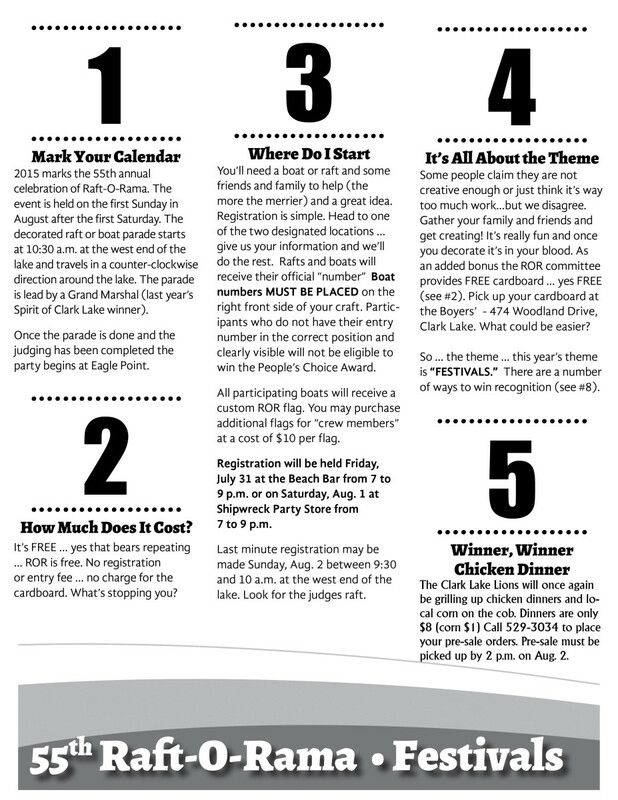 The “Ten Things…” mailer also noted there was to be an Harvest Moon event on August 29. That also has been cancelled. 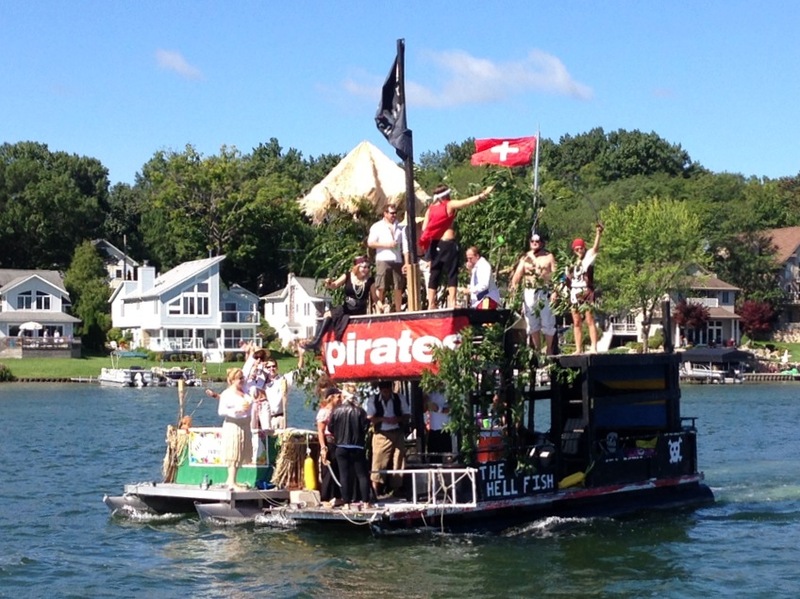 Meanwhile, new Raft-O-Rama goodies are turning into hot items. 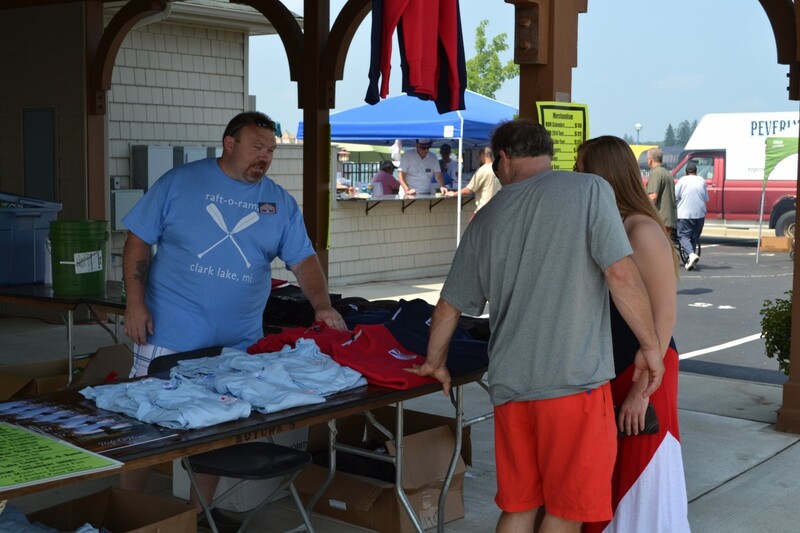 The towels are a particular hit, and have sold out. 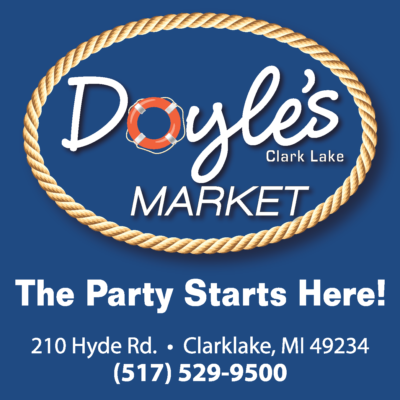 A new supply should be available at Doyles by tomorrow (Friday). 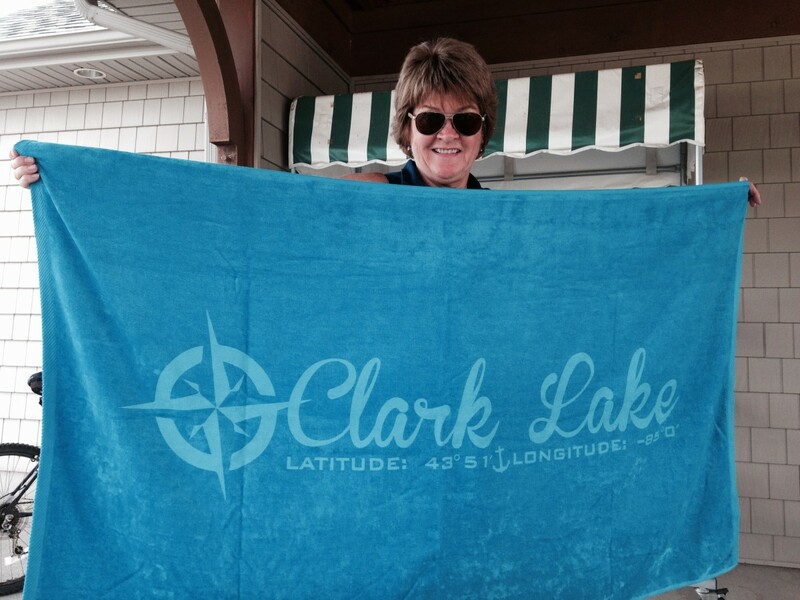 Trisha Boyers displays the Clark Lake towel. Two colors, and they are hot items! The new line of t-shirts just arrived today. They are now on display and available to purchase at Doyles. 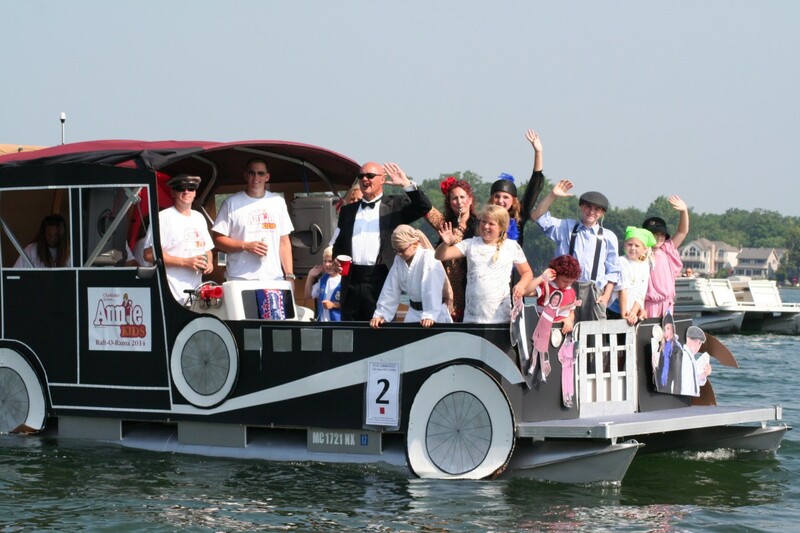 They are particularly eye-catching, and if you’re interested, don’t delay. (Click first photo to enlarge, then click on right of photo to move to the next one). 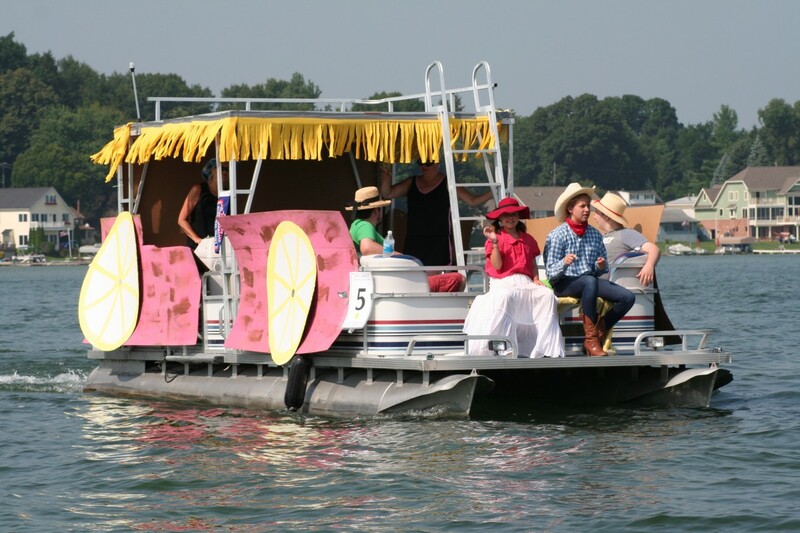 Hats are always popular, and this year Raft-O-Rama introduces a new design. 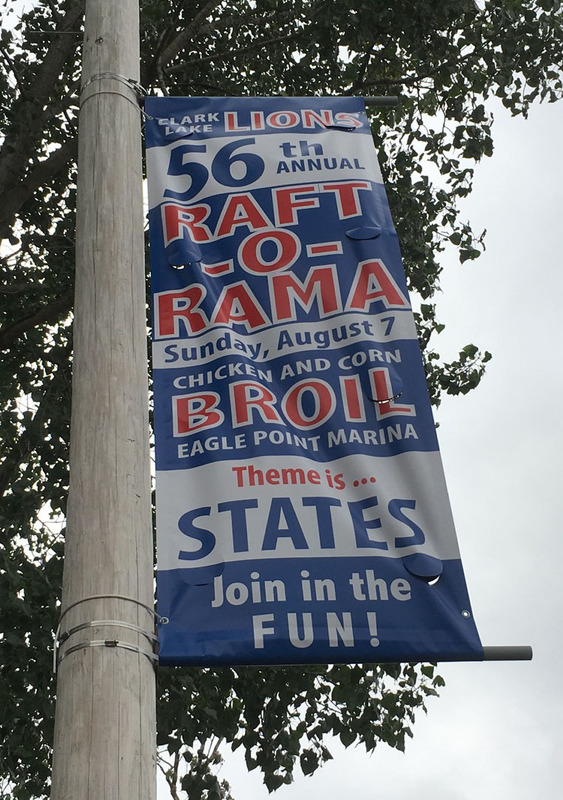 The full range of Raft-O-Rama goodies may be purchased at the Point on Sunday during the Lion’s Club Chicken Broil and R-O-R awards ceremony. 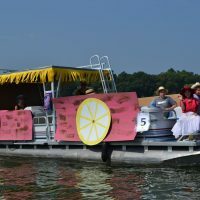 This year the committee will be accepting credit cards. 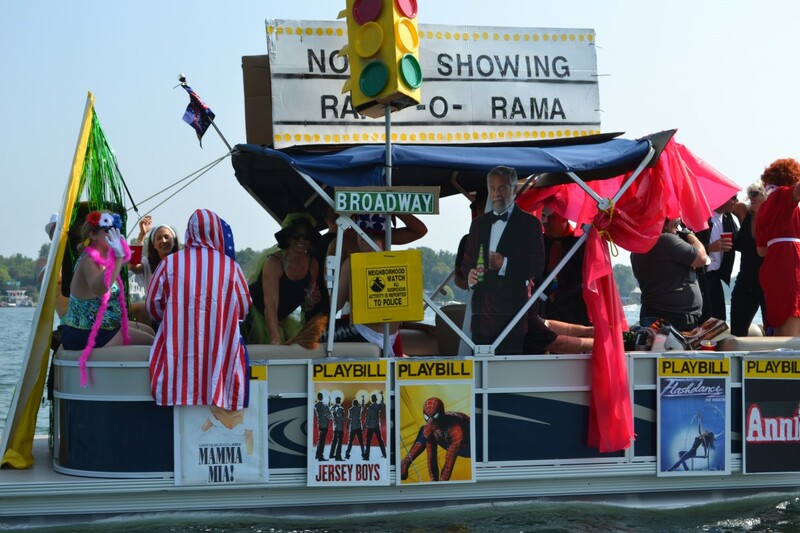 And some memories from 2014’s Raft-O-Rama. 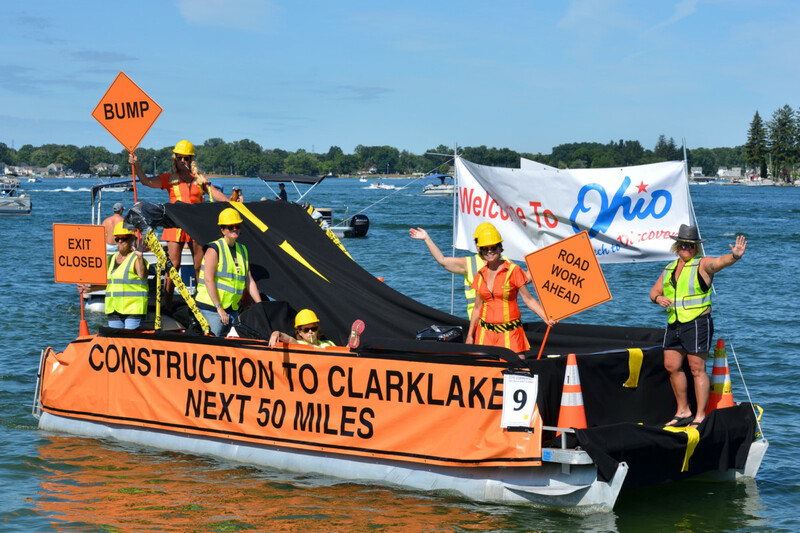 Once again the Raft-O-Rama committee is making Clark Lake look as good as it is. 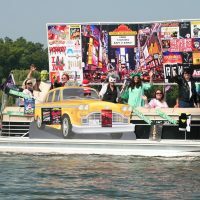 They have just introduced their new line of goodies, all with the name of our favorite place on the items–towels, hats, koozies, calendars and more. 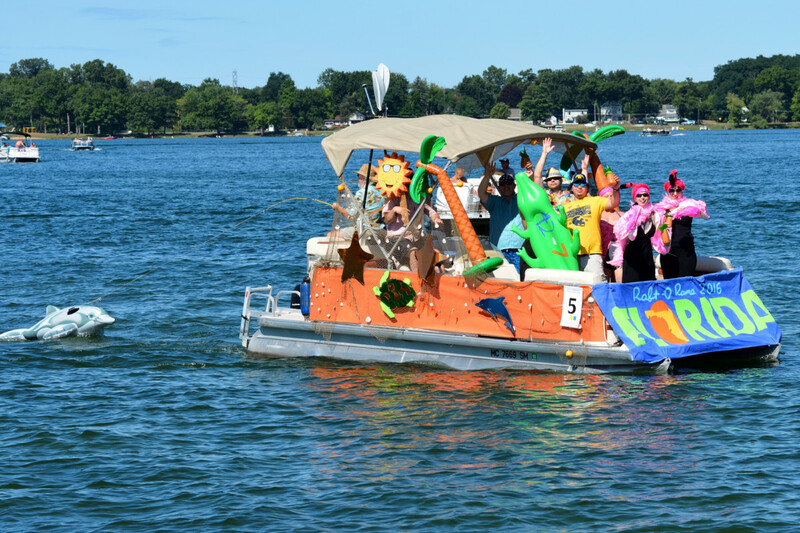 Proceeds from the items support the efforts of Raft-O-Rama. 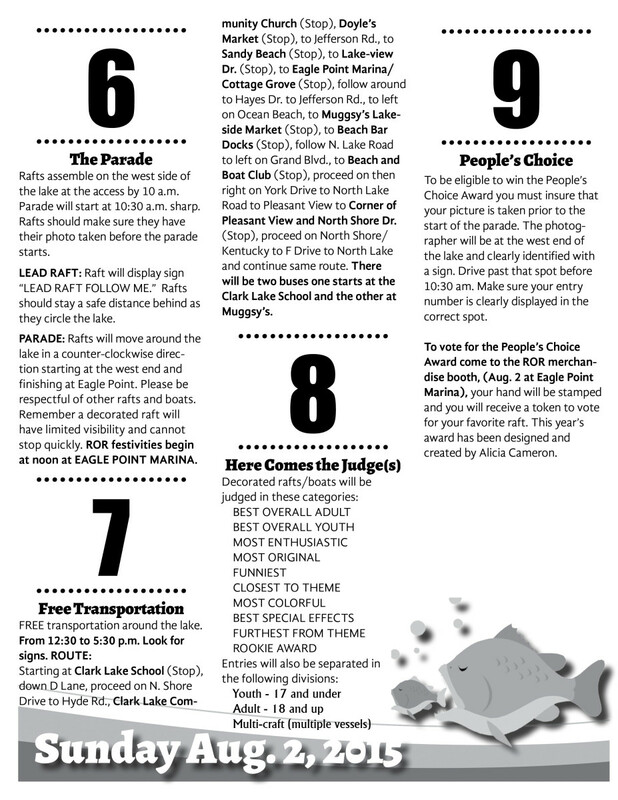 You can purchase them at Doyles on Hyde Road and on Sunday, August 2nd (day of the event) at Eagle Point. 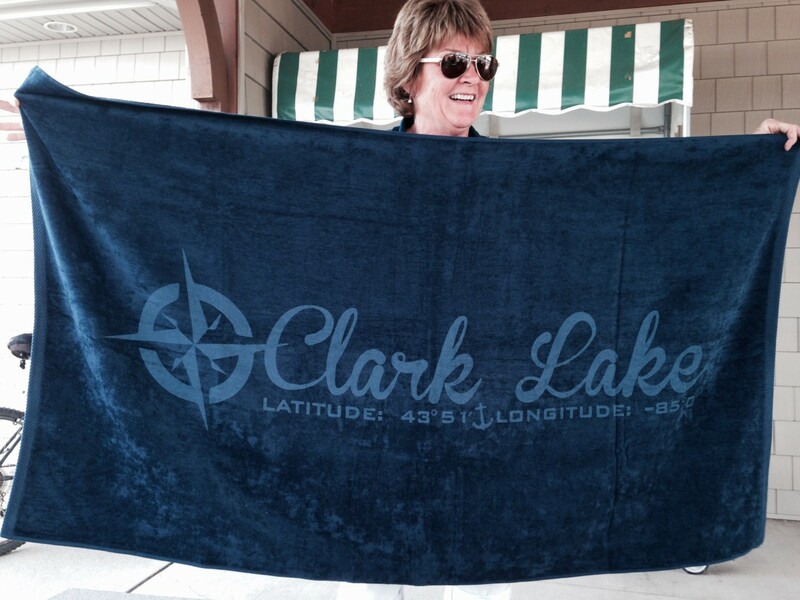 Tricia Boyers displays the Clark Lake towels, that include the latitude and longitude in case you ever lose your way. And the towels come in designer colors! 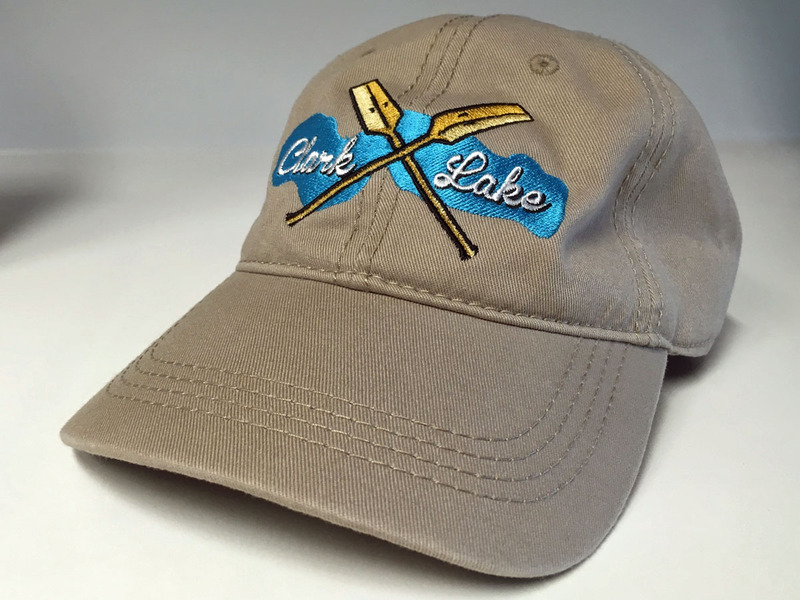 Hats off to the whole committee for the hard work and dedication, but especially to Dotty Karkheck for acquiring and design of merchandise. 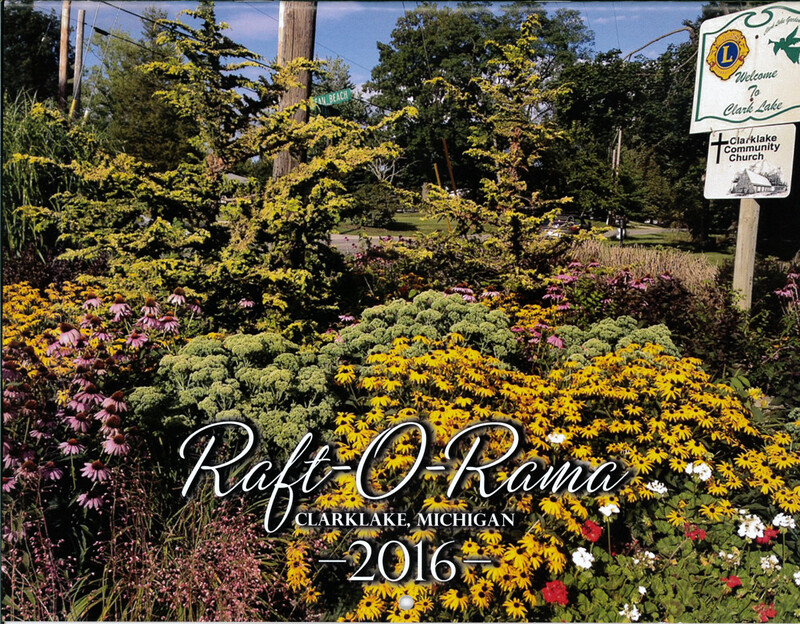 Below is the 2016 Raft-O-Rama calendar, the work of Karen Menard. 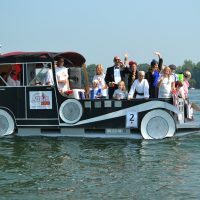 Photographers include Jade Romanowski Beard, David Beard, Mike Hendges, Kelly Petitto, Kelly Marie Lyke, Kathy Jenks Hendges, Lindsay Mercer and Rick Belcher. 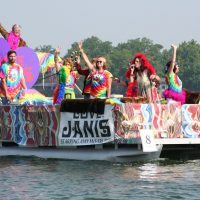 The cover photo is from this website. 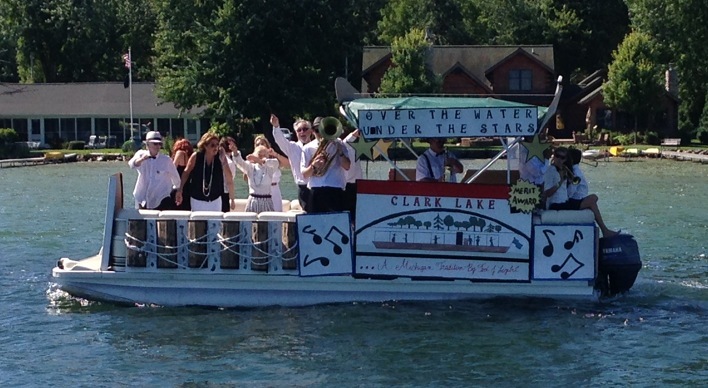 Now is an interesting time at Clark Lake. 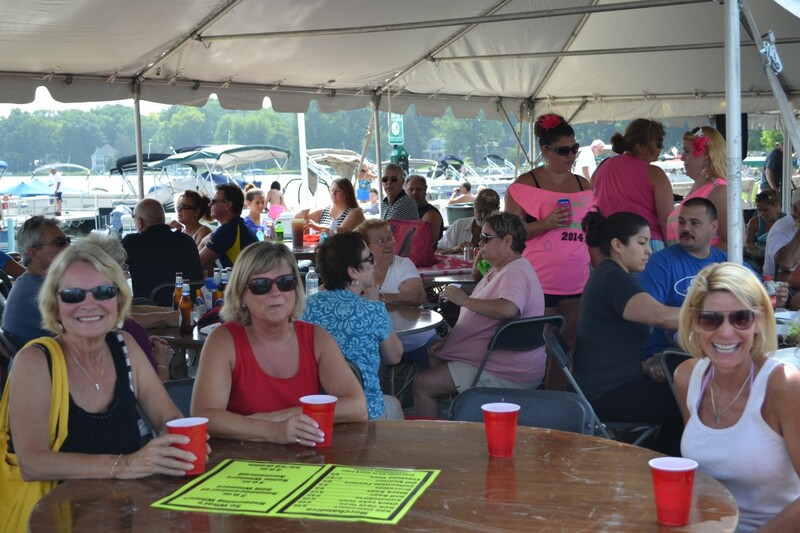 At the Beach Bar you see people talking but in hushed tones and their hands obstructing view of their words. 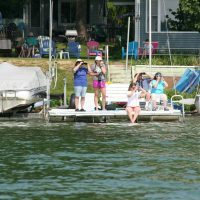 As you go around the lake you see neighbors conferring quietly. When you approach the conversation suddenly changes. What’s going on? 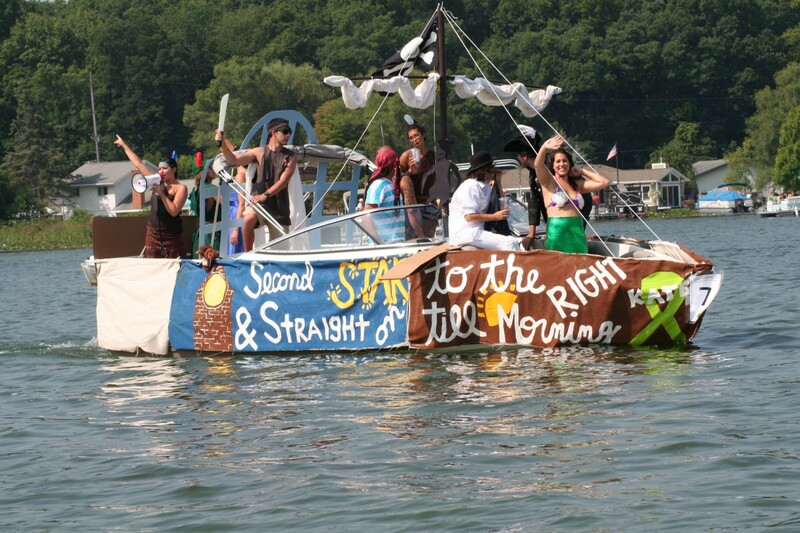 The secrets are about their entry for Raft-O-Rama. 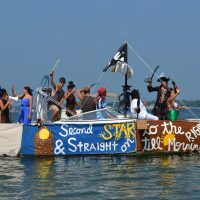 This, after all, is a competition for Best Overall Adult (18 and over) & Youth (17 and under), Most Enthusiastic, Most Original, Funniest, Closest to Theme, Most Colorful, Best Special Effects, Furthest from Theme, and Rookie Award. At tonight’s R-O-R committee meeting, Best Costume returned as a category. 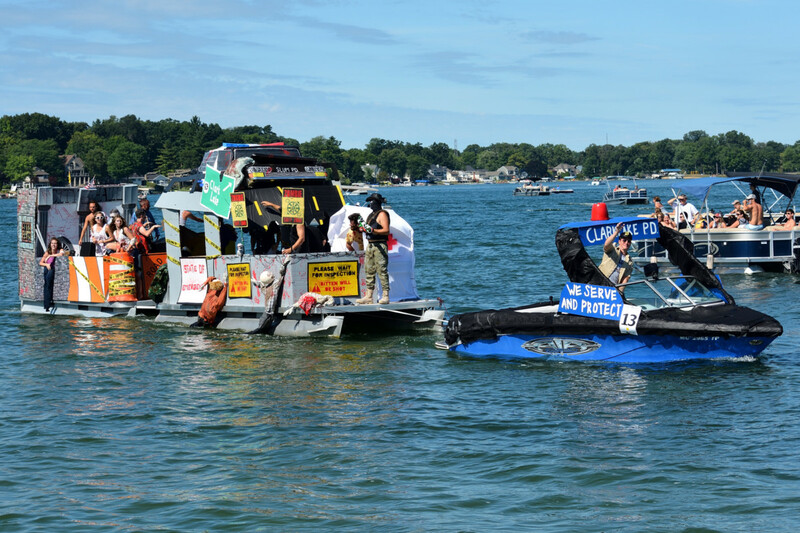 Entries will also be separated if there is more than one vessel involved. 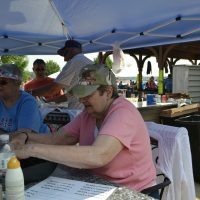 You can vote for the People’s Choice award at Eagle Point, the site of the Lions Club chicken and corn roast. 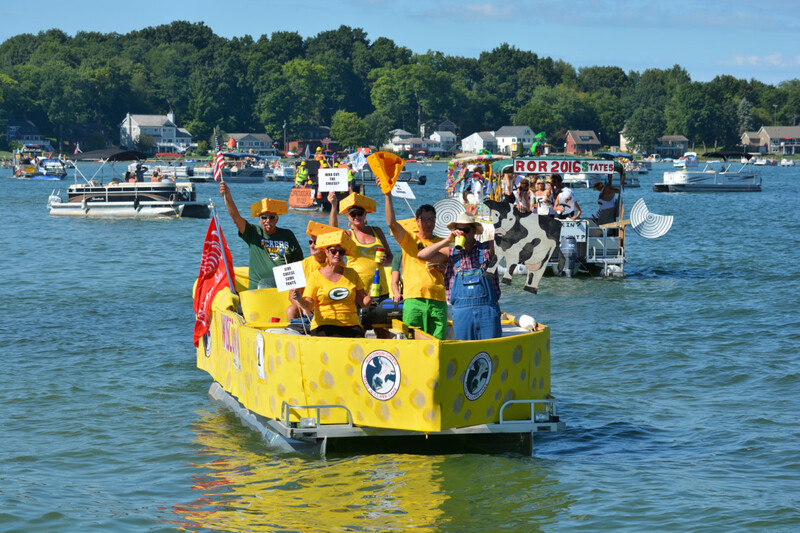 And of course, the Raft-O-Rama sails on Sunday, August 2. 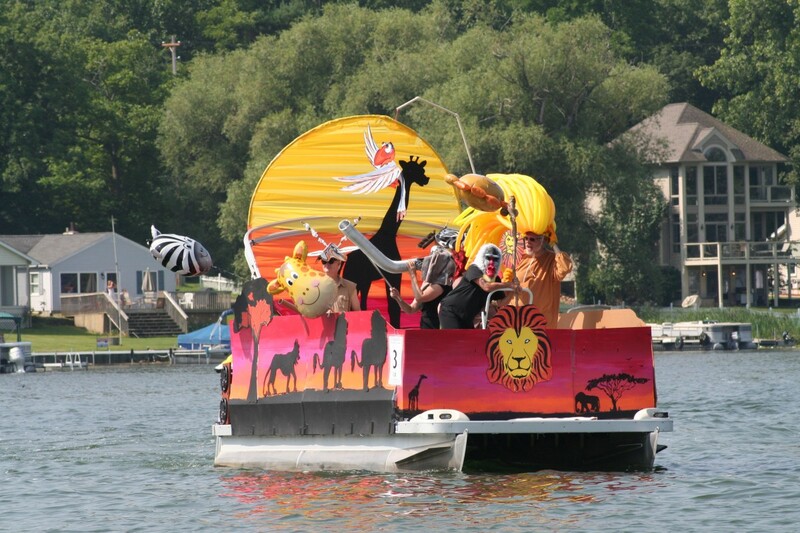 Competing rafts assemble at the head in the area of the lake boat launch at 10 am and the parade begins at 10:30 am. 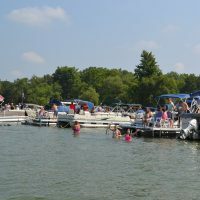 The rafts circle the entire lake, going counter-clockwise. 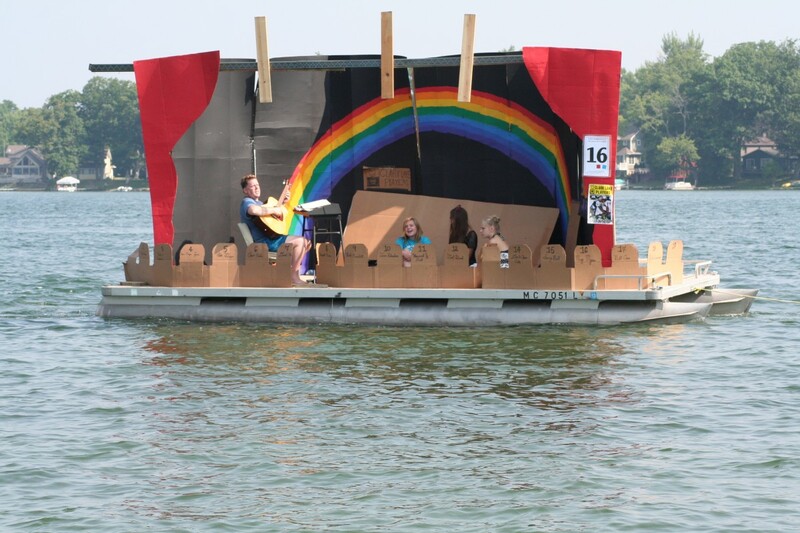 Cardboard is a primary building block to decorate rafts. 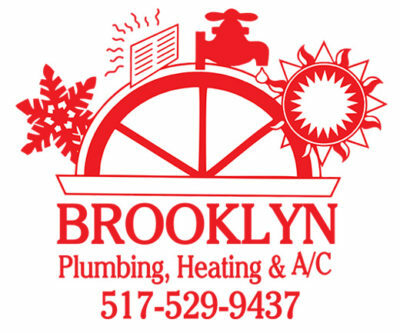 And it’s free at the Boyers, 474 South Woodland. 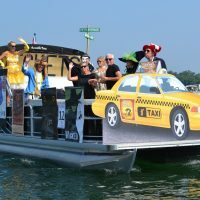 The theme is Festivals, and the committee hopes you give your ideas free reign and put all your ingenuity and creativity on display. 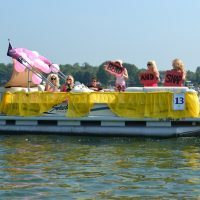 Scroll down for complete Raft-O-Rama info. 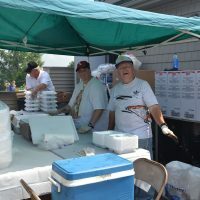 The Lions Club chicken and corn roast starts at noon at Eagle Point (also where you vote on the People’s Choice Award). 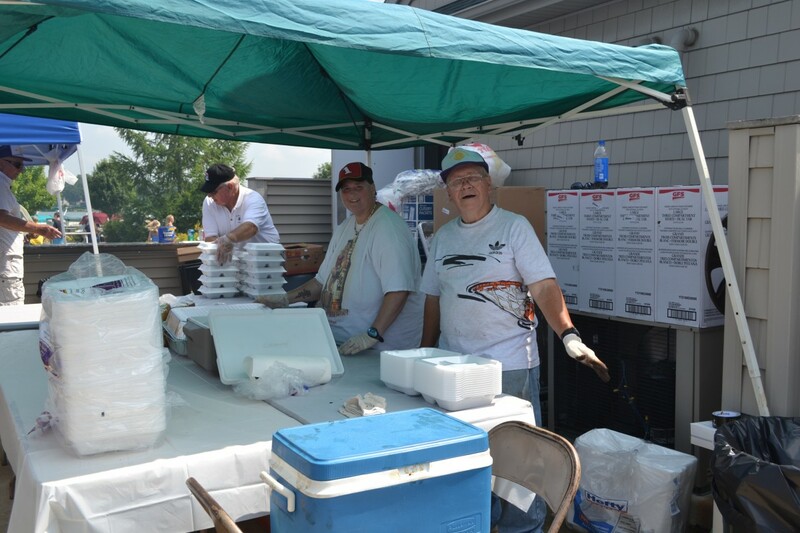 Last year, the Lions broiled no less than 1,000 chickens and 800 ears of corn–and sold all of it! 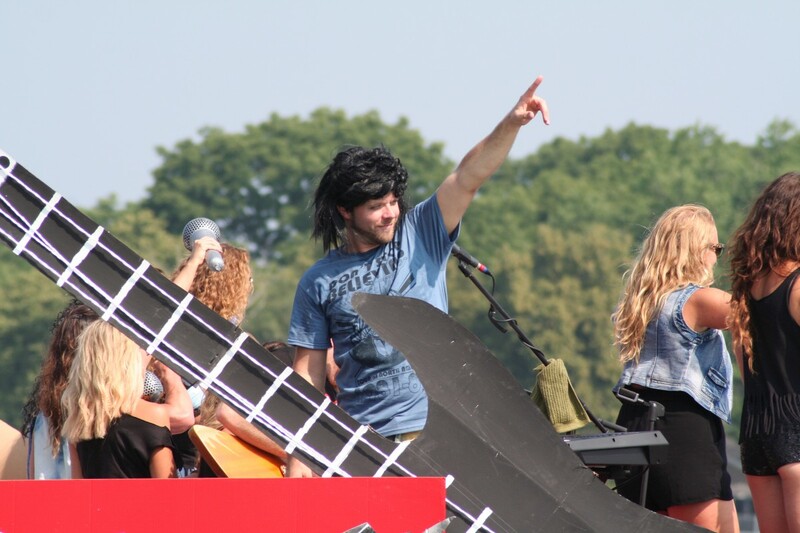 They promise more of it this year. 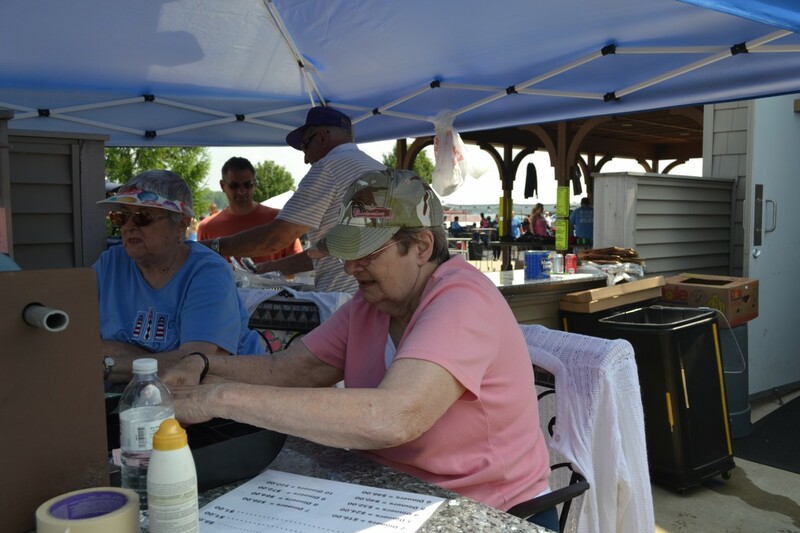 At Eagle Point and at Doyles on Hyde Road, you can purchase items to remember the day by–hats, towels, shirts, & koozies. 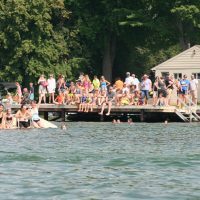 Eagle Point is the site of the awards ceremony and other fun activities like face painting and snacks like snow-cones and hot pretzels. 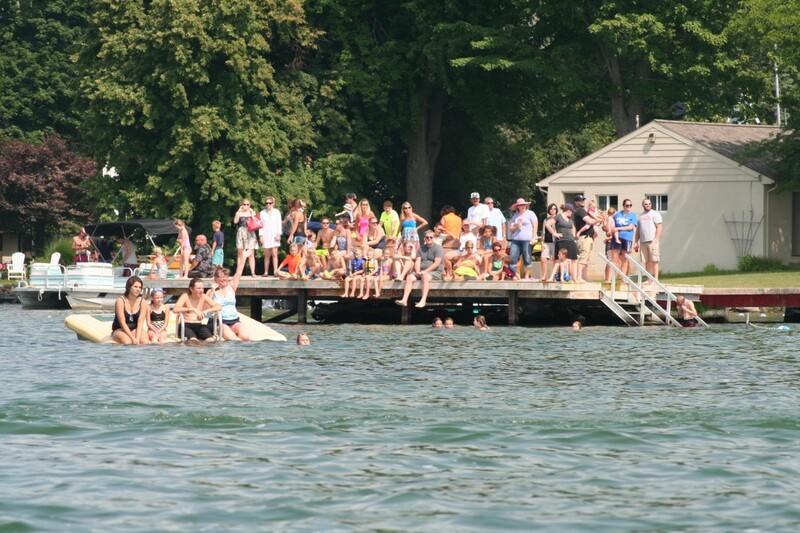 The weekend of the Raft-O-Rama is big. 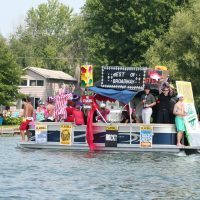 It starts with fireworks Friday night (July 31), continues with Run Clark Lake on Saturday (August 1), and Raft-O-Rama on Sunday (August 2). Friday night fireworks feature a 45 minute display with John Menard in command. 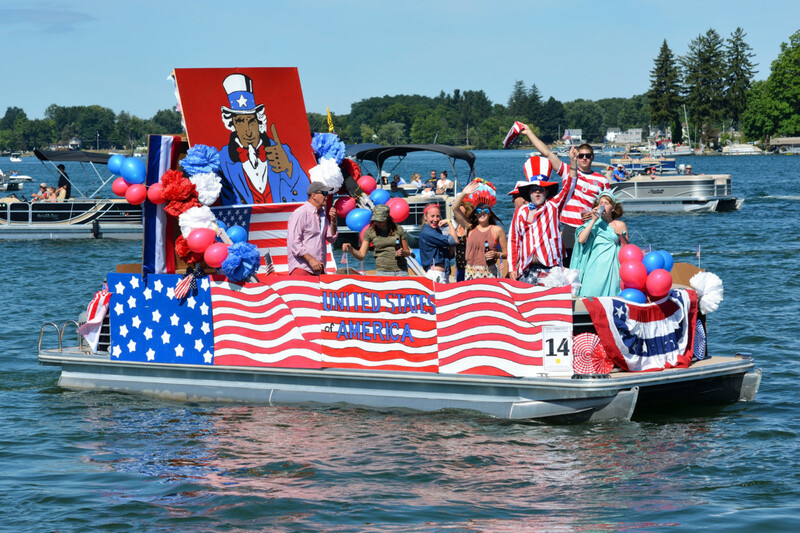 You may recall that the Menard family has been credited with some of Clark Lake’s most impressive Independence Day fireworks displays. 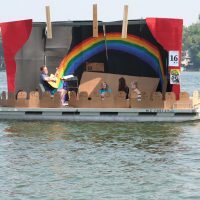 The Raft-O-Rama Friday night fireworks will be launched on the south side of the east end of the lake (Kennedy’s). 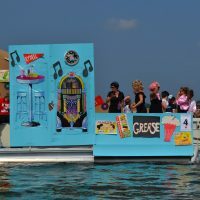 You can best view the display on the water. 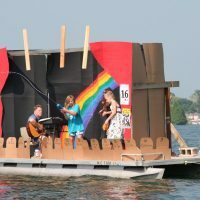 As this is an extensive presentation, the Raft-O-Rama is looking for your help through donations. 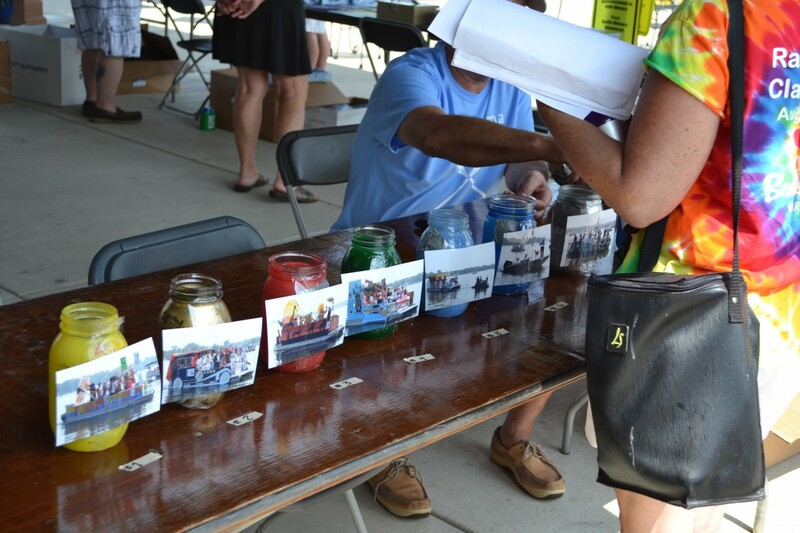 You can donate by credit card on this website (tax-free) or in one of the canisters at Doyle’s, Mugsy’s or SaveTime. 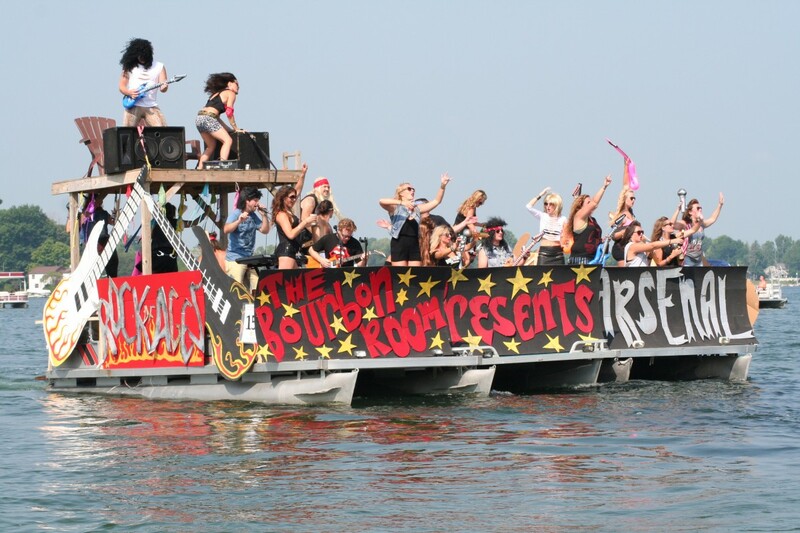 A Clark Lake iconic tradition is about to happen. 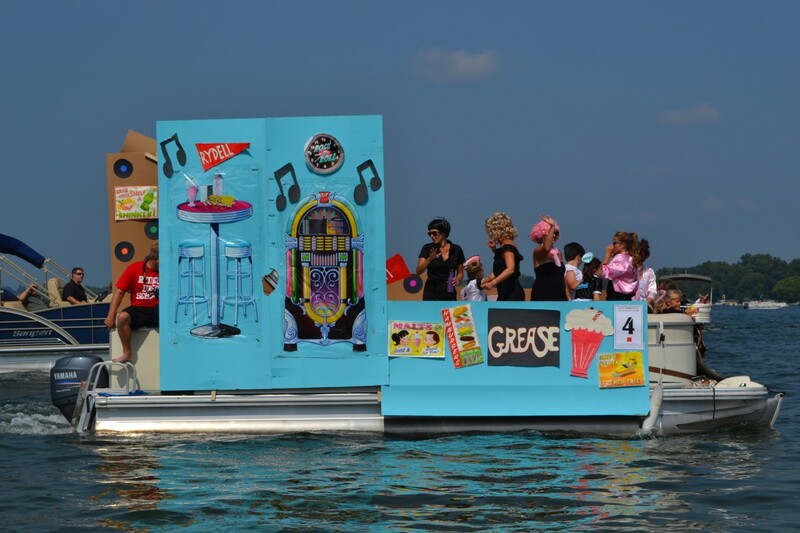 The 55th annual Raft-O-Rama will turn the lake into a very large stage on Sunday, August 2. 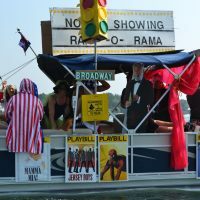 Whether part of the “audience” or one of the “performers”, Raft-O-Rama always offers top grade entertainment. 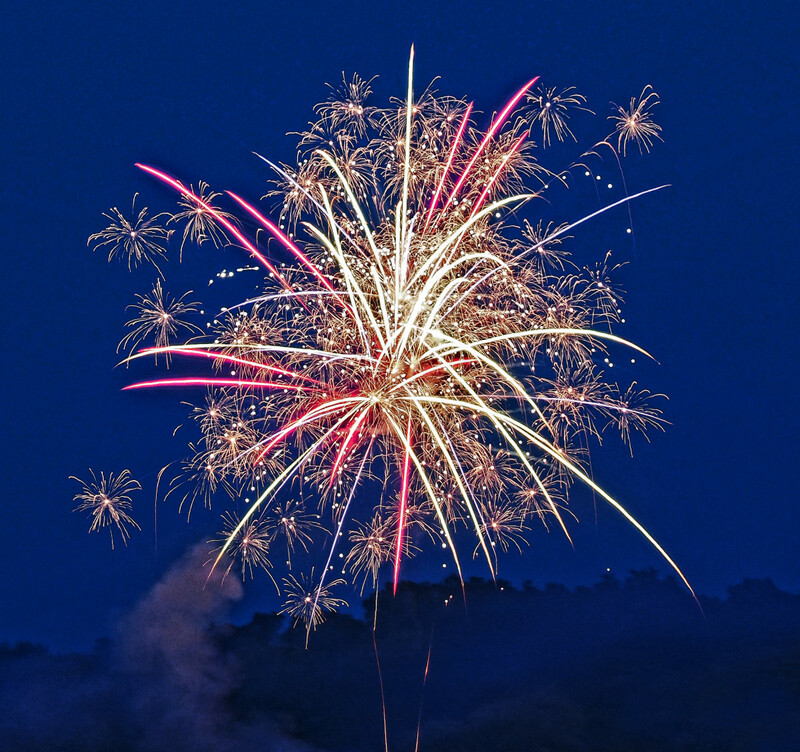 The weekend kicks off with Friday night fireworks. 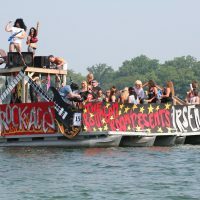 R-O-R is presenting a display that will last 30 to 45 minutes. 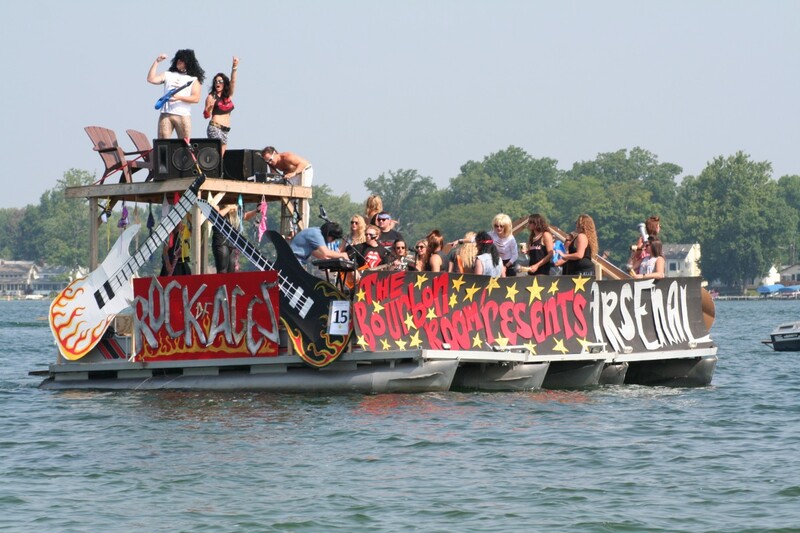 The best place to view it will be on the lake at the east end. 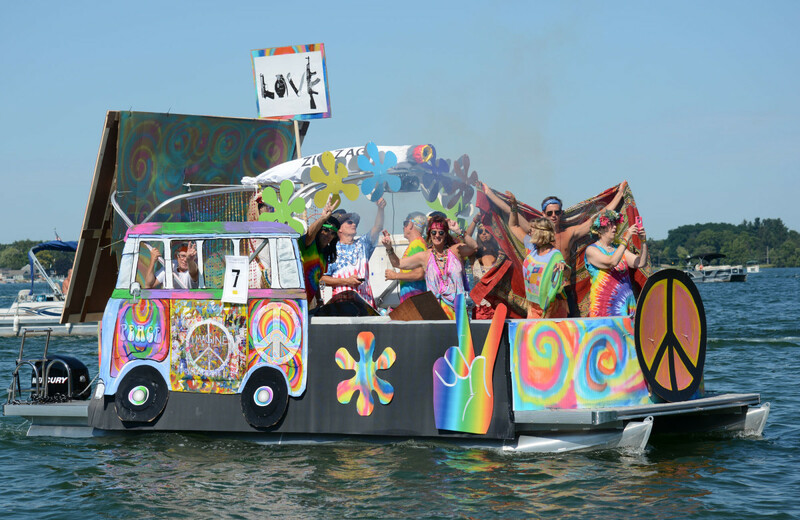 The fireworks will be launched from the south shore, about midway between the Point and Ocean Beach. Considering the ambitious scope of the fireworks, your contribution will be gratefully received. 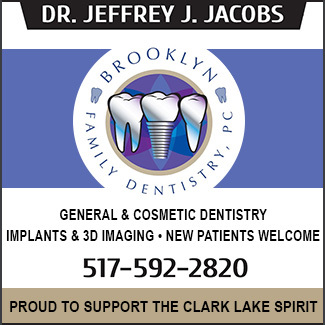 You can find a canister in the community or you can make a tax advantaged donation through the Clark Lake Spirit Foundation via credit card on this website. 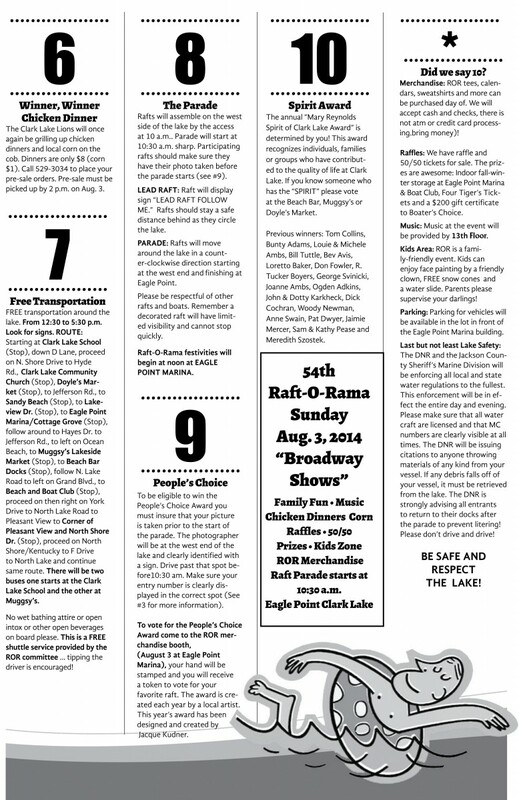 In between the Friday night fireworks and the Raft-O-Rama on Sunday is Run Clark Lake. 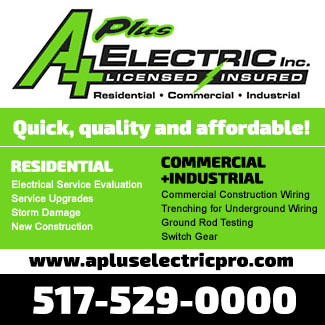 You can get information about it by clicking here. 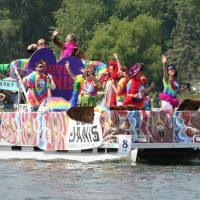 The theme is “Festivals. 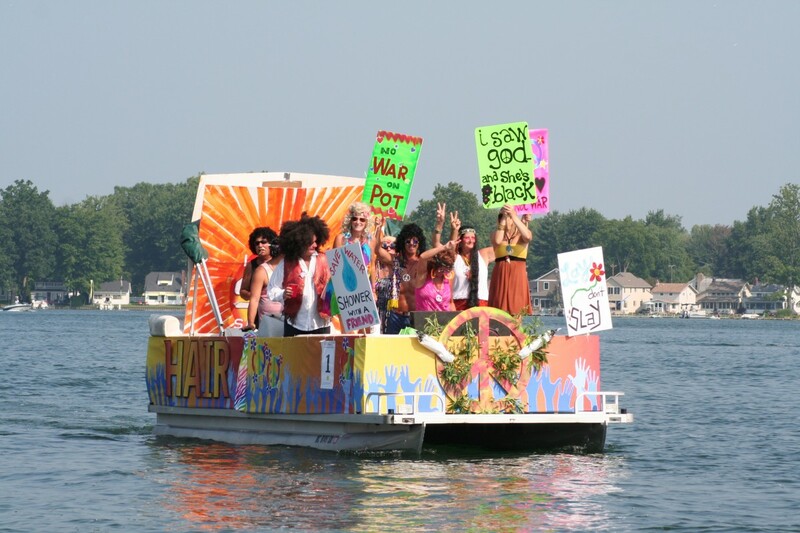 Right now your neighbors around the lake are plotting on how they will win this year’s competition. 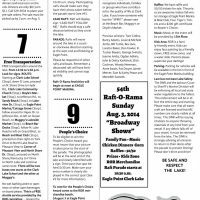 ” “Ten Things You’ve Always Wanted to Know about Raft-O-Rama but Were Afraid to Ask” is on the way to mailboxes around the lake. What follows is a preview. 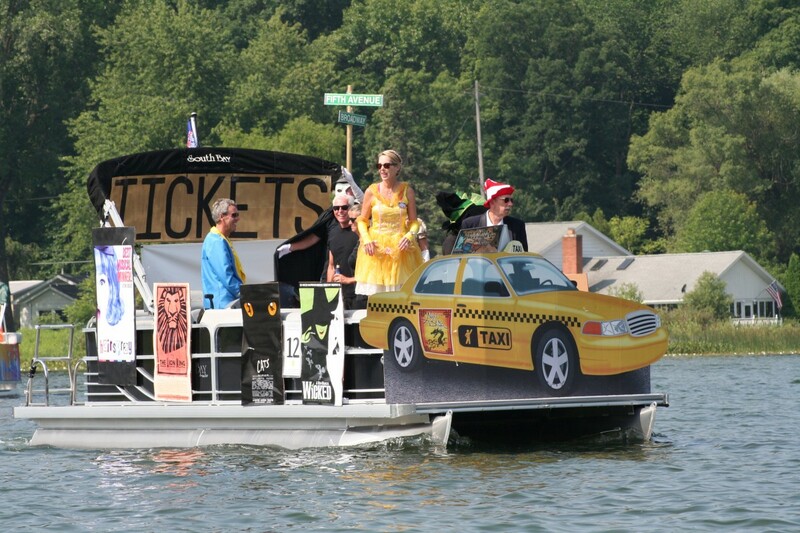 The committee puts in many hours recreating this event every year. The information piece above, designed by Dotty Karkheck, is an example. 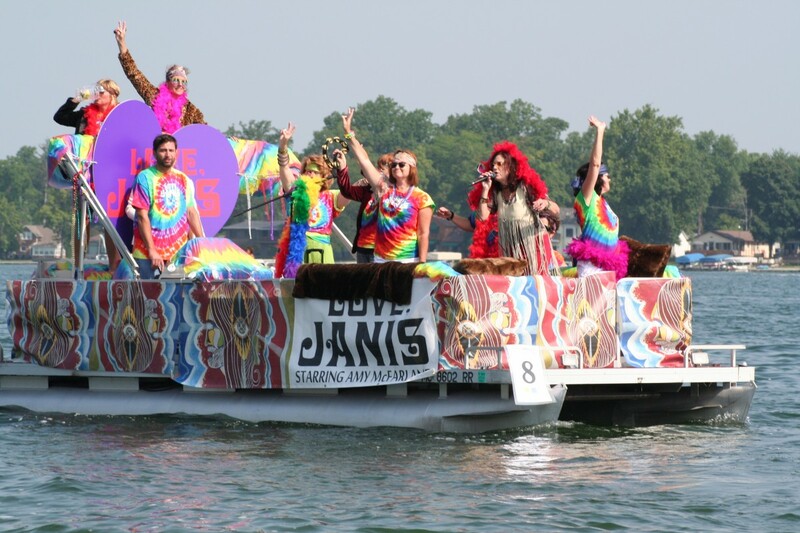 From now to the day of the event, August 2nd, this theme will be a focus of both thought and activity. First comes the inspiration, then engineering imagination, and finally, the construction. 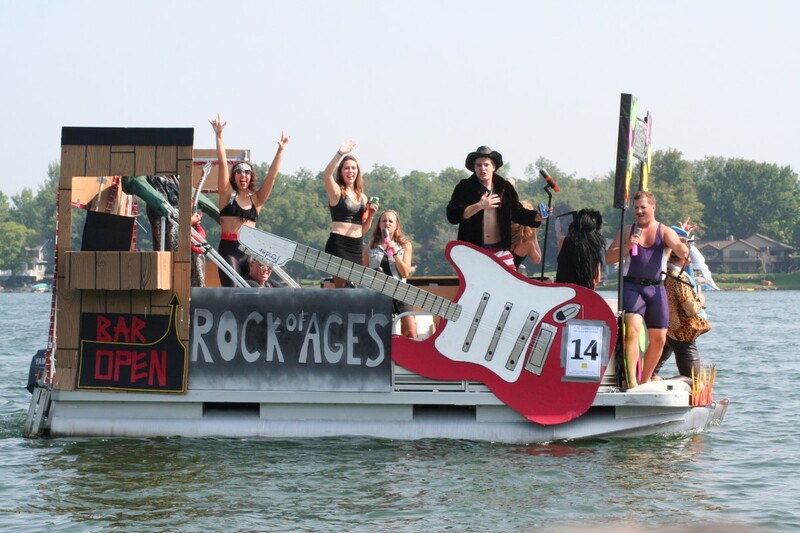 Every year, the theme for the next Raft-O-Rama is chosen by the winners of the past year. 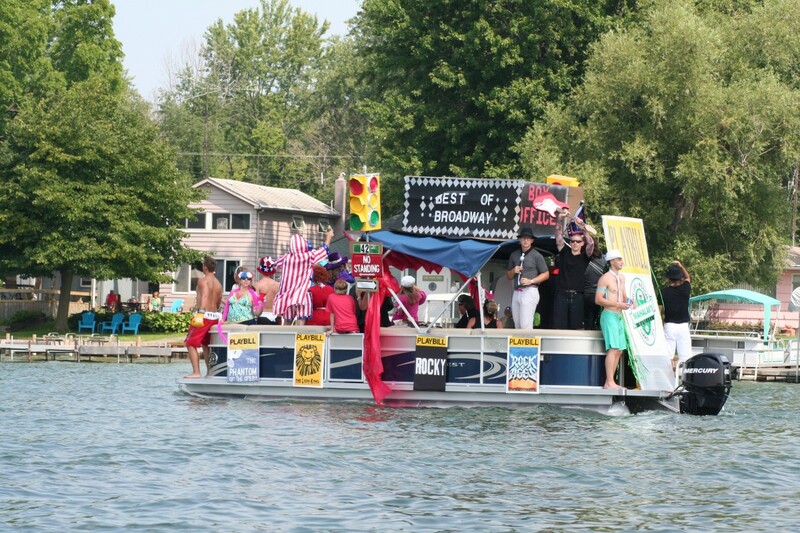 The theme for 2014 was “Broadway Shows’ that turned Clark Lake into a revue of the finest shows to be seen on stage. 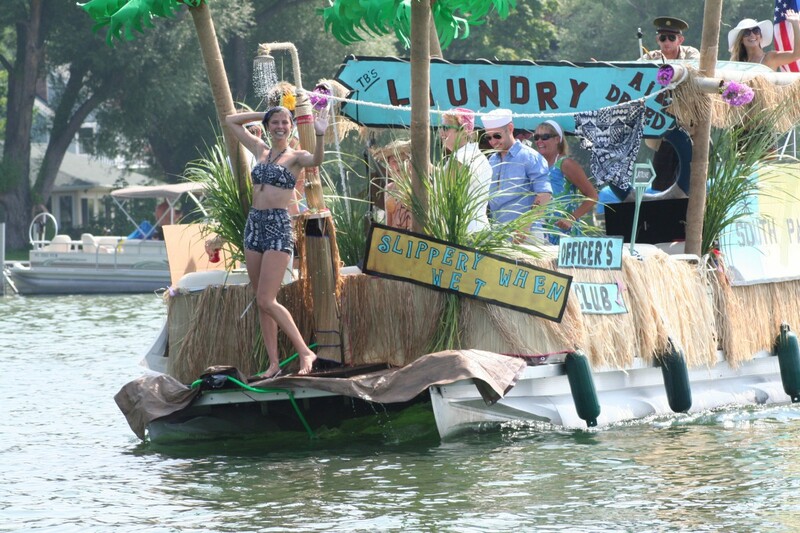 Raft-O-Rama has been a major part of Clark Lake summers for over a half-century. 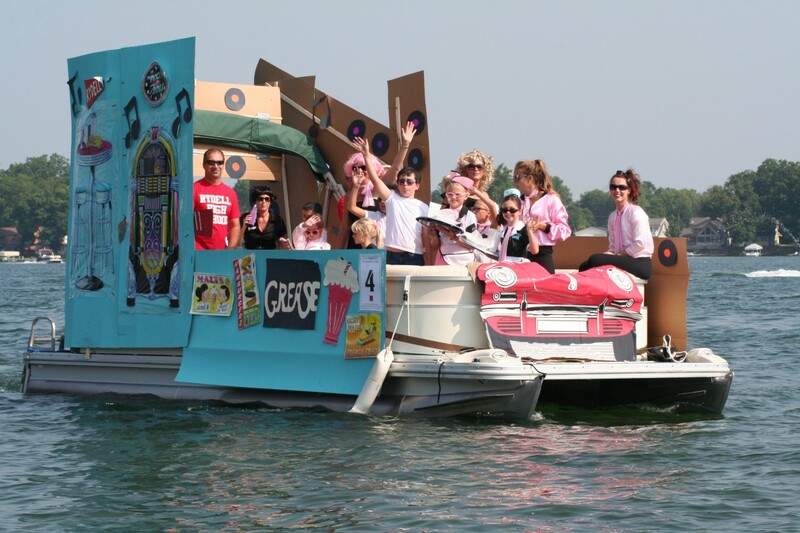 It’s a major community activity inspired by creativity and ingenuity. 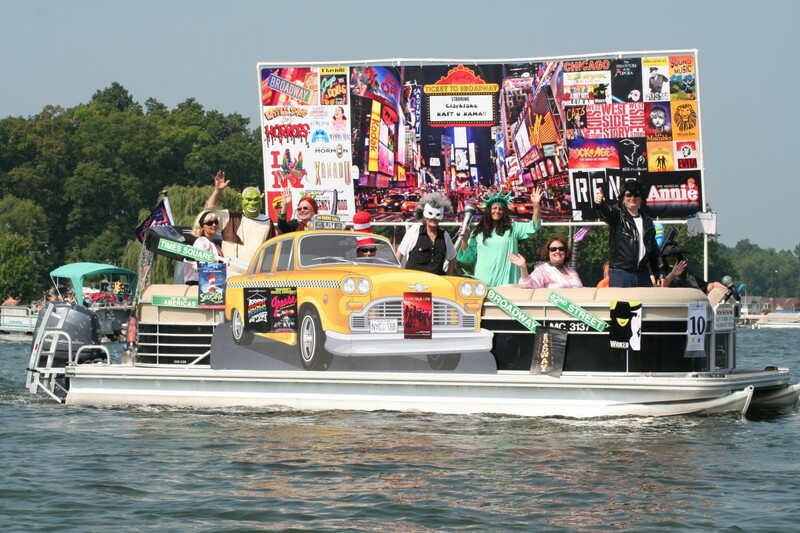 Seventeen rafts, decorated to the hilt with the theme of Broadway Plays, entertained Clark Lake to the max. 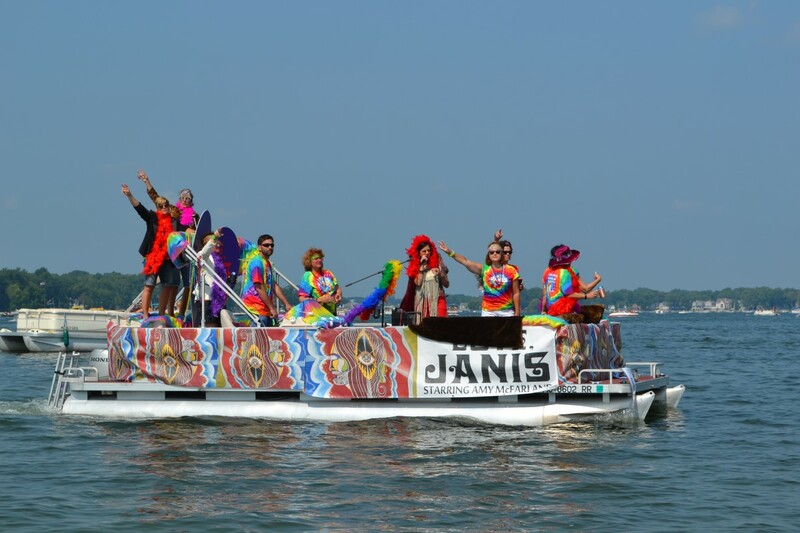 The rafts followed the shoreline with their colorful artwork and crew members with bright and exciting costumes. Lots of smiling faces combined with endless energy. It was a day for creative ideas. 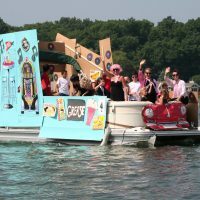 In some cases, the entries called upon not only creative-types, but the engineer/builder-types, who could turn the ideas into working entries. 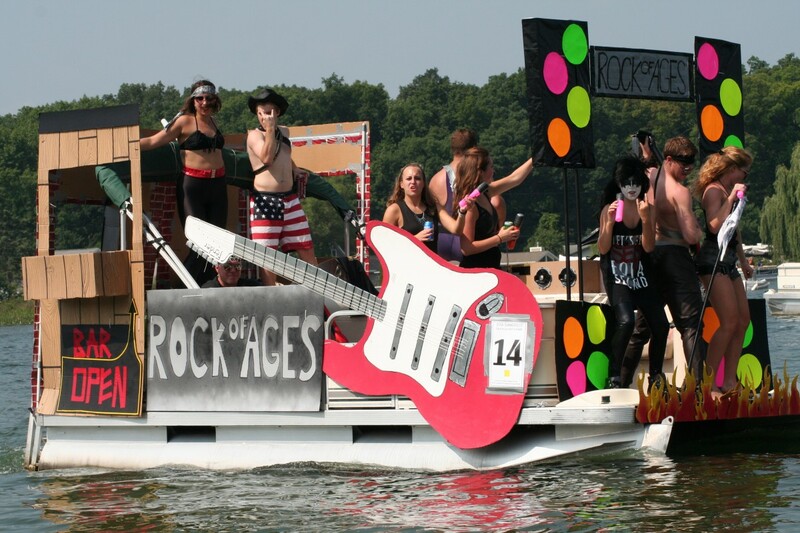 Two examples of engineering feats were seen in South Pacific and a Rock of Ages entry. 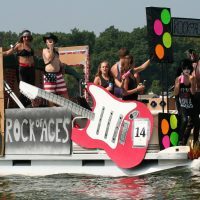 On South Pacific, there was a working shower as Brandi Zak “washed that man right out of her hair.” For a Rock of Ages raft, three rafts were tied together to present a massive stage for the performers. 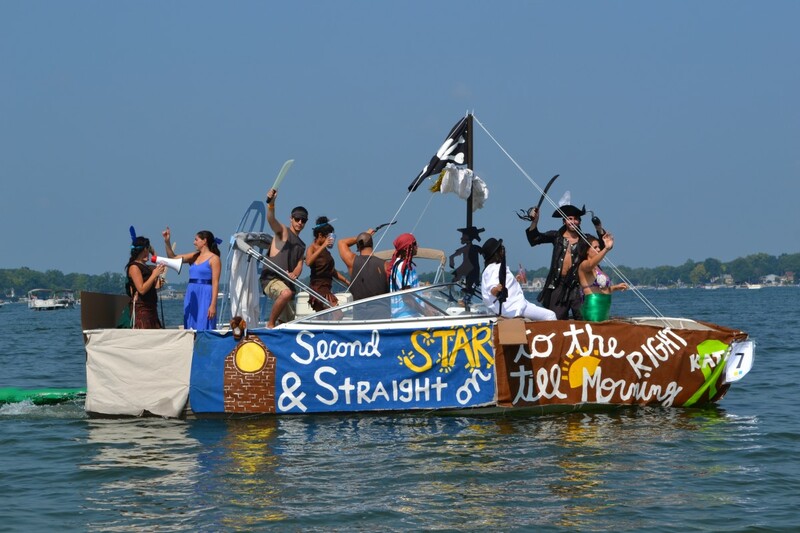 Have you ever tried to go down the lake with even two rafts tied at the hips? Hard to pull off. 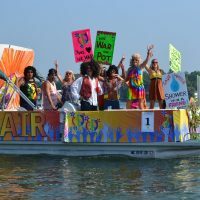 Many of the entries featured music from their Broadway show, and it all worked. 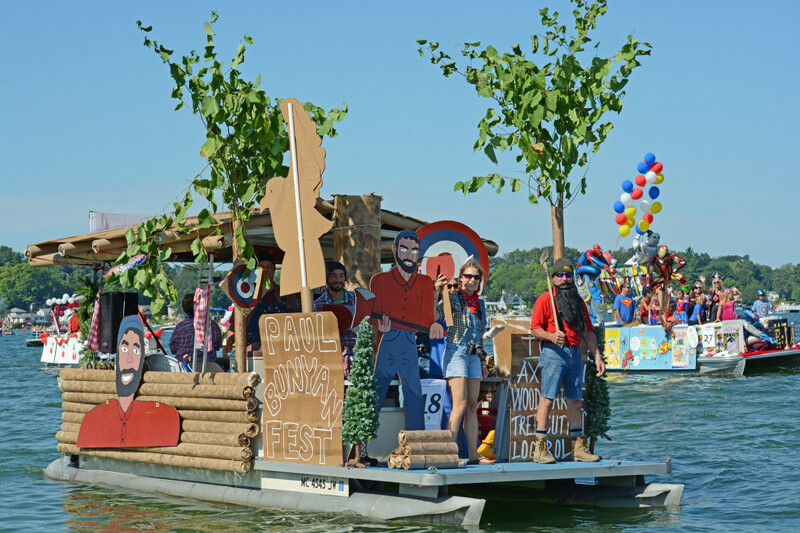 Put it all together and you have a Raft-O-Rama that exceeds expectations! 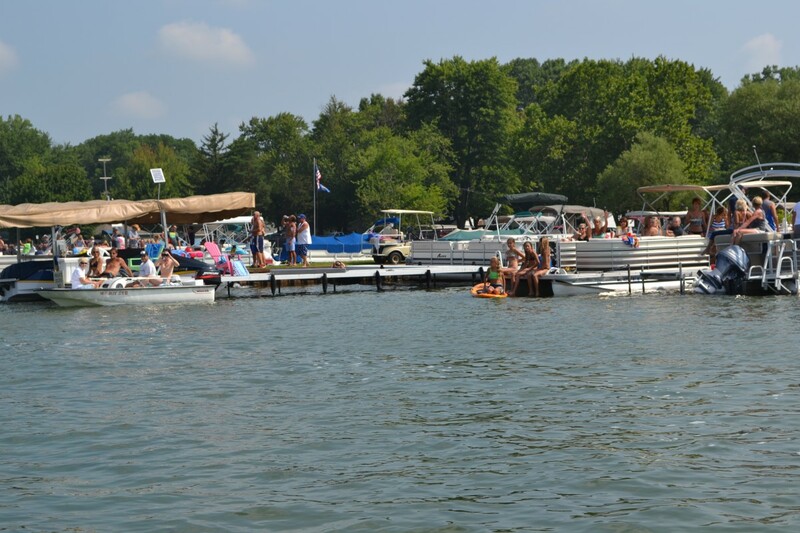 The day was perfect for Raft-O-Rama–78 degrees plus just enough breeze to keep you cool in the bright sun. Now it’s photo-fest time. 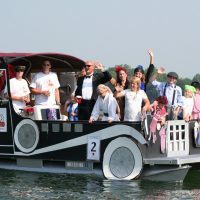 In some cases, you’ll see multiple photos for an entry. How many photos were used is about how well the photos turned out and if they improved visual perspective. The number aside the name of the entry is used only to identify it. That number, and the order in which the photos are presented, have no special significance. 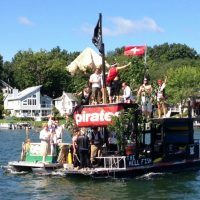 Have some photos you’d like to share? Email them to [email protected] Note: click or tap any photo to enlarge. Repeat to reduce. 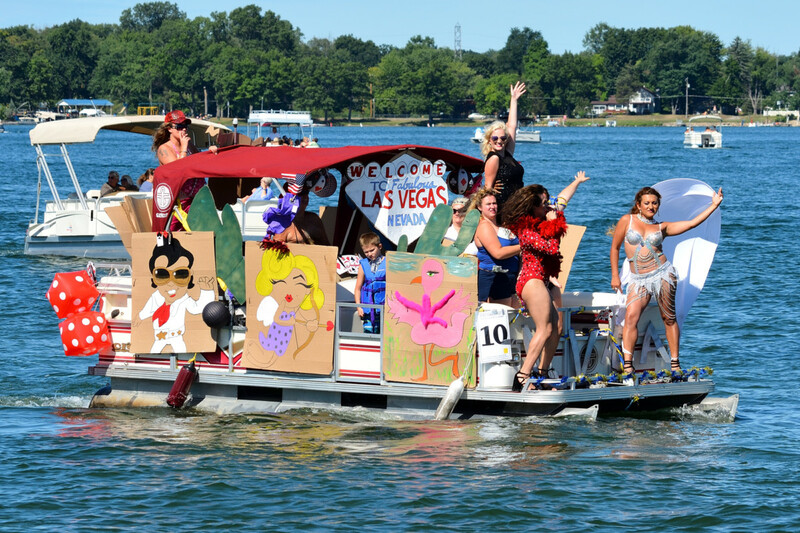 There were hundreds lining the shores of Clark Lake to watch the parade of rafts competing for the various titles. 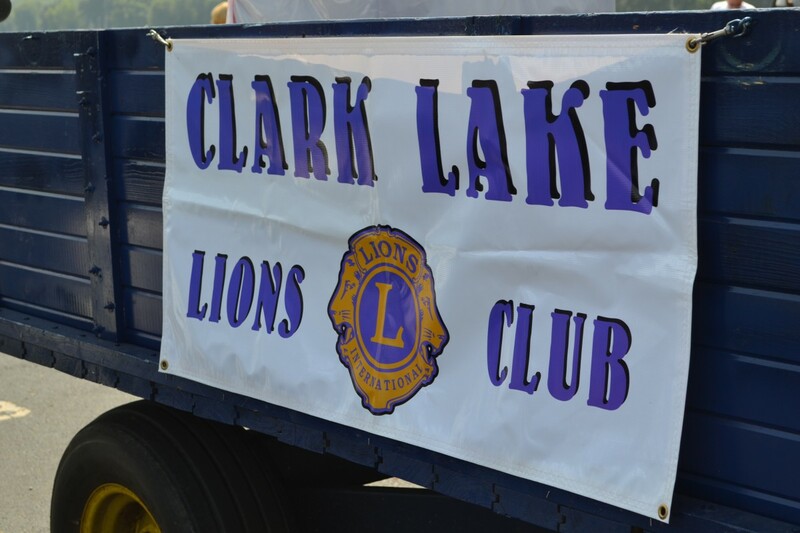 After the parade, it was off to Eagle Point for grilled chicken courtesy of the Clark Lake Lions. 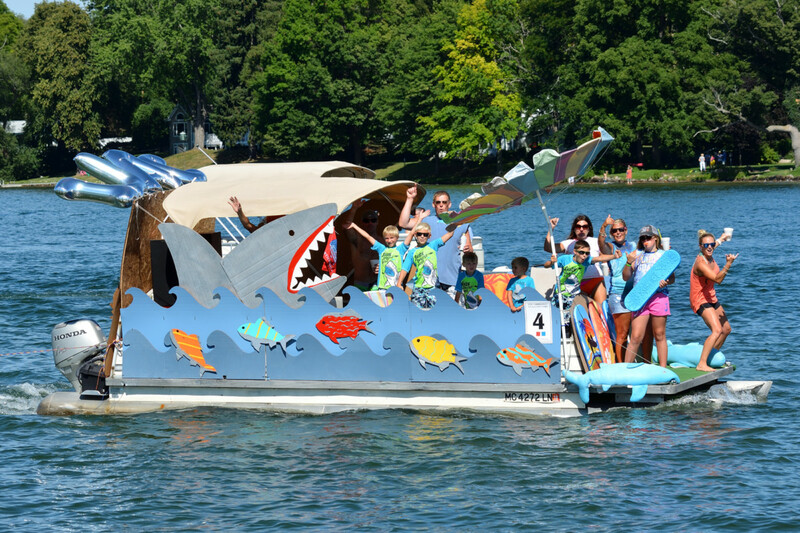 The 2014 Raft-O-Rama, Sunday, August 3rd. 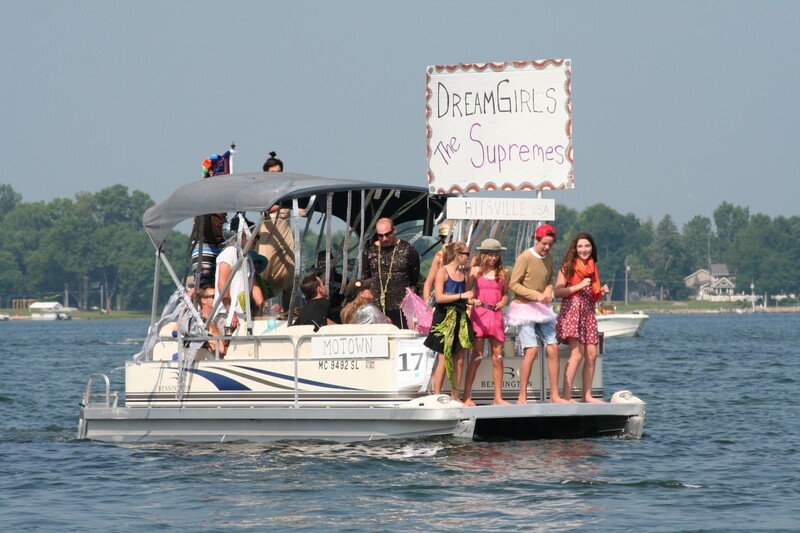 Rafts will assemble at the west end of the lake at 10 am, and the parade begins at 10:30 am. 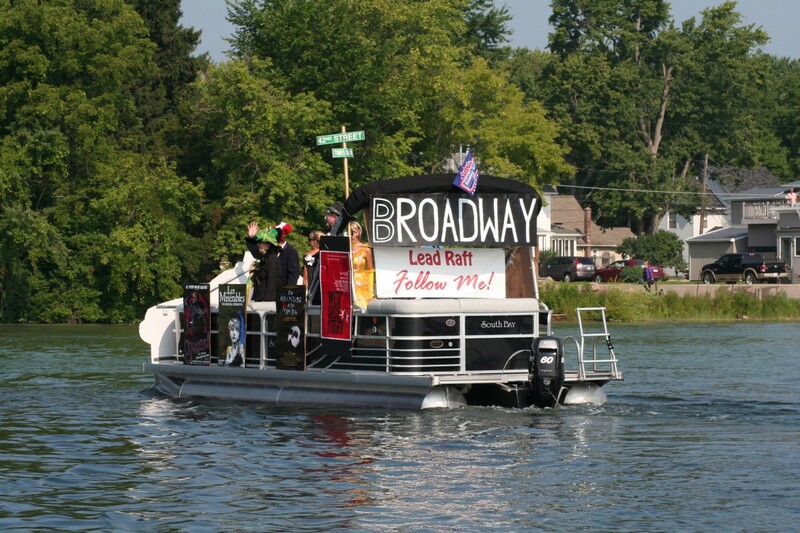 The rafts, decorated in the theme “Broadway Plays”, will follow the shoreline around the lake and end at Eagle Point. 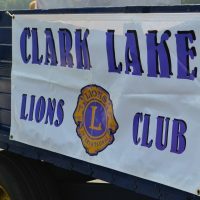 The Clark Lake Lions Club will once again have their chicken dinner at the Point. 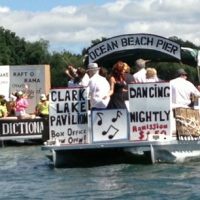 What’s going on at Clark Lake? Neighbors are speaking in hushed tones, voices hardly above a whisper. 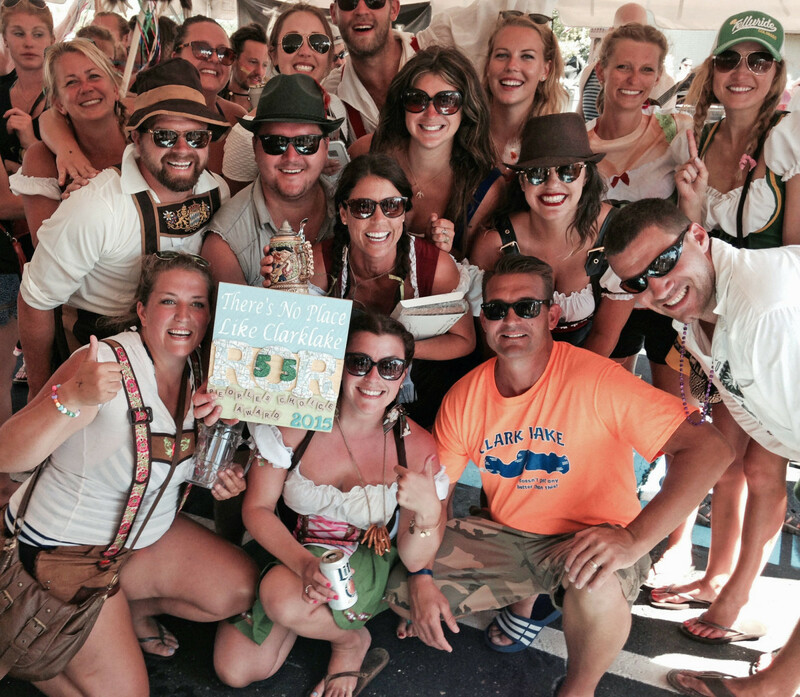 Or walk up to a table of animated talkers at the Beach Bar, and suddenly there is awkward silence. As you drive the roads behind the houses, you get furtive looks as residents quickly shut their garage doors. What are they hiding? 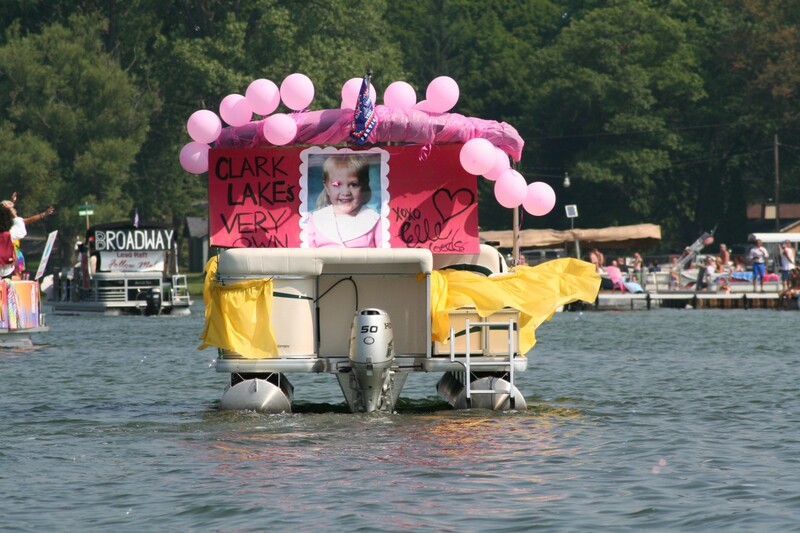 If you’ve been at Clark Lake for a while, you can figure it out. 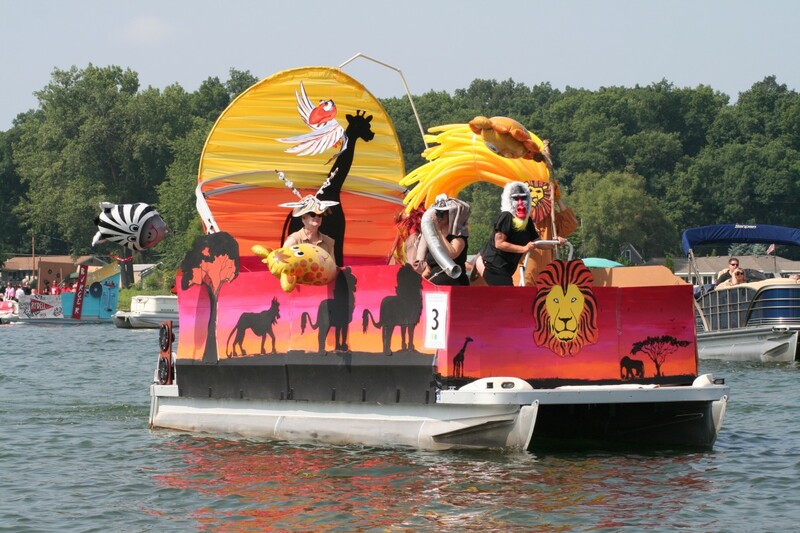 It’s the week leading up to the Raft-O-Rama, one of Clark Lake’s premiere events. 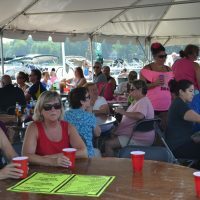 Plans are being hatched, engineering skills are being called upon, and plenty of thinking is taking place on how to put it all together the night before, or morning of, Sunday, August 3rd. And do those entering employ spycraft learned from watching too many movies? Well, who wouldn’t want to know what the competition is up to? 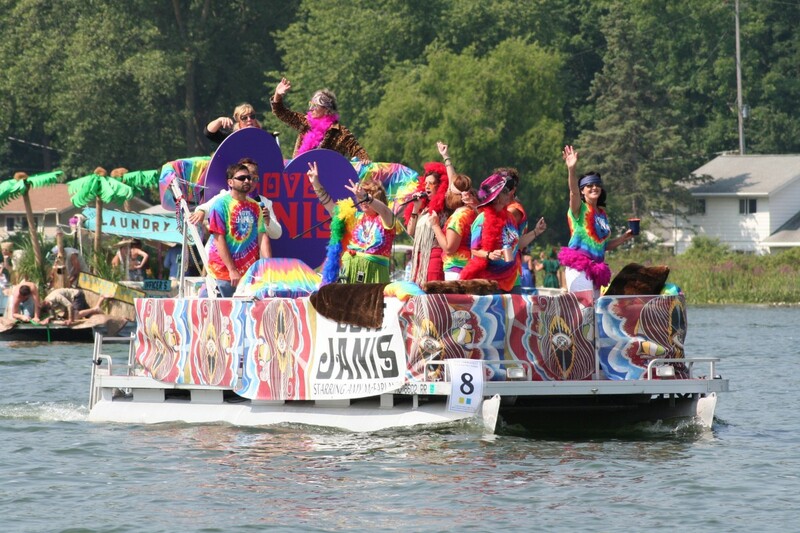 And that is the reason for Clark Lake secrecy this week. There is a desire to win, and that desire results in lots of creativity. 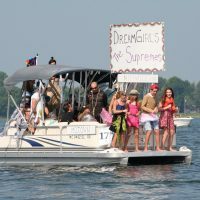 This motivation only makes the day more interesting to the hundreds of spectators lining the shores or following the parade of rafts around the lake. 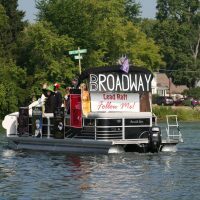 This year’s theme is “Broadway Plays”. 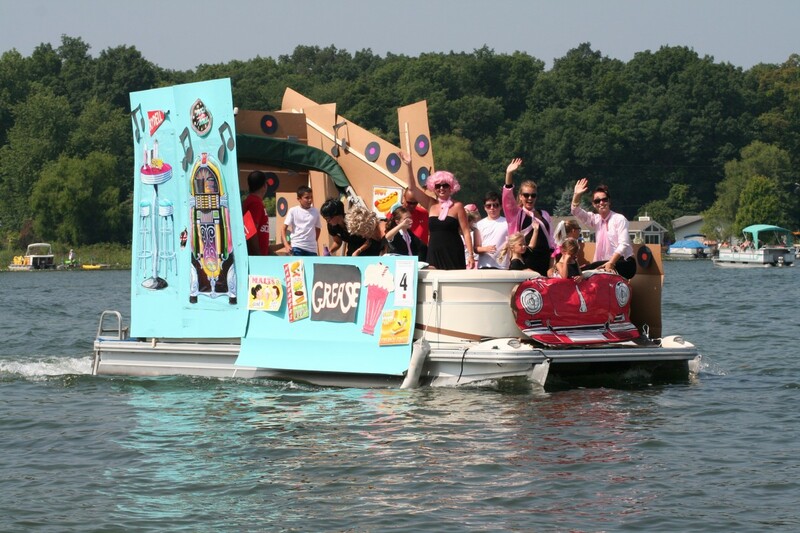 As in every year gone by, this day promises to be lots of fun. 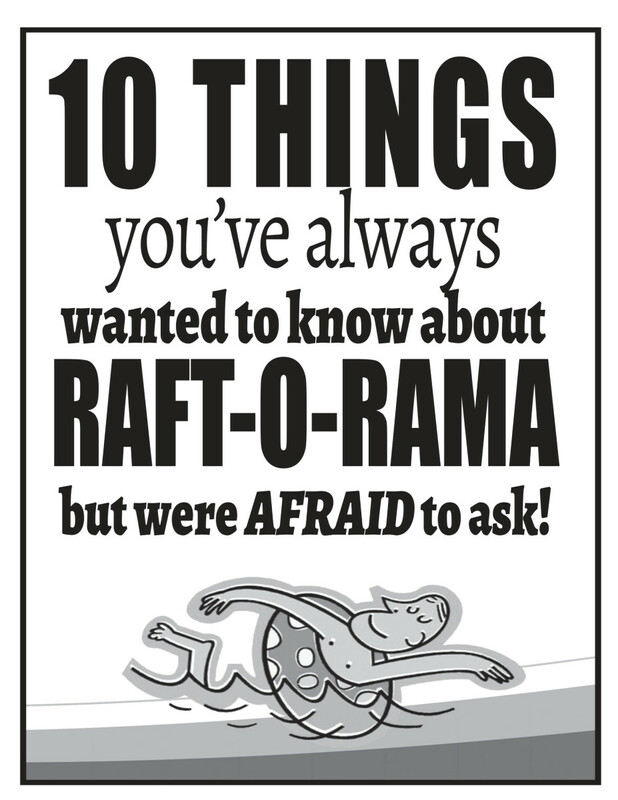 The Ten Things You Need to Know about Raft-O-Rama can be accessed by clicking here. 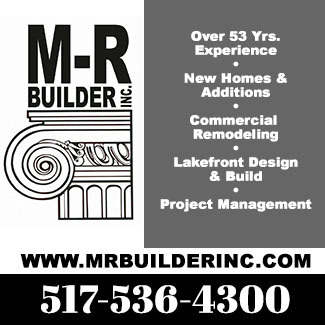 And if you need corrugated board for your construction project, you can get it for free from Tucker Boyers, 474 S. Woodlands, 529-4466. 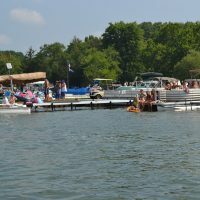 Enjoy Raft-O-Rama? 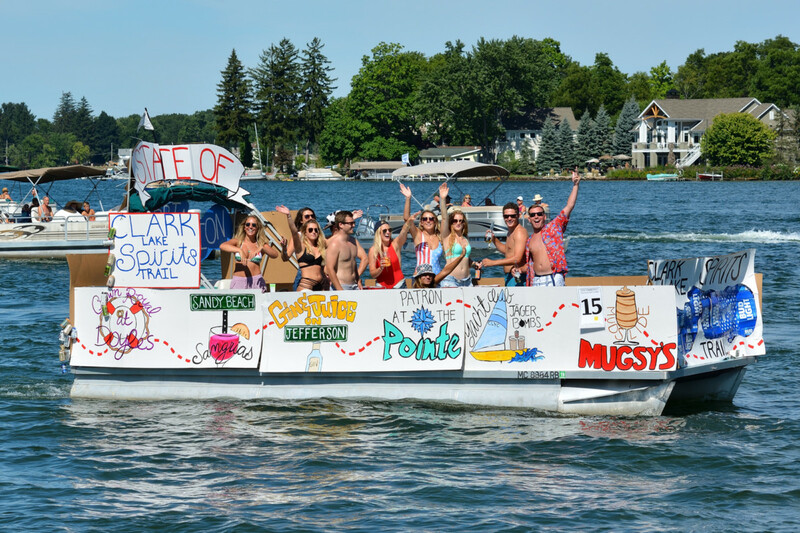 You can make a donation through this website or by writing a check to the Clark Lake Spirit Foundation, PO Box 224, Clark Lake, MI 49234 and note that it is for the benefit of Raft-O-Rama.